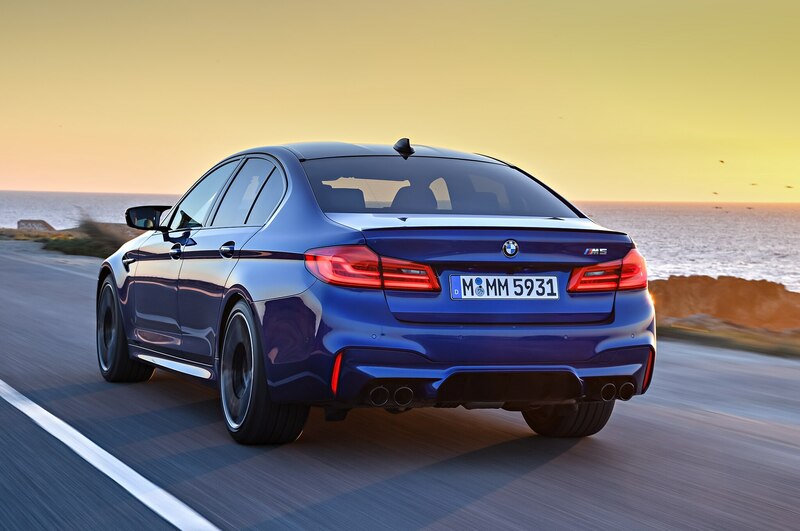 BMW’s beefy high performance sedan is back with a vengeance. 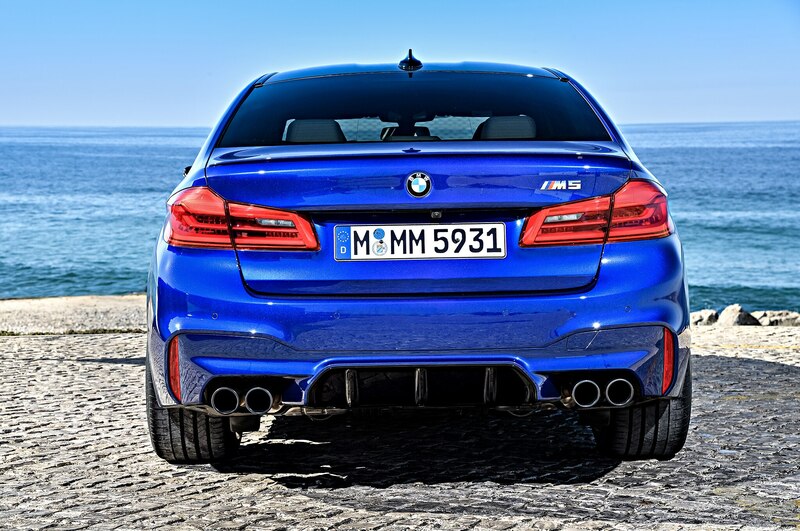 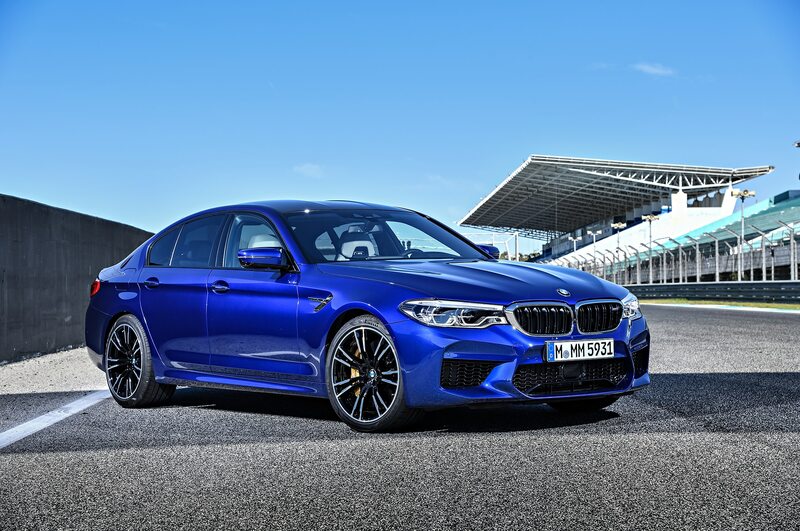 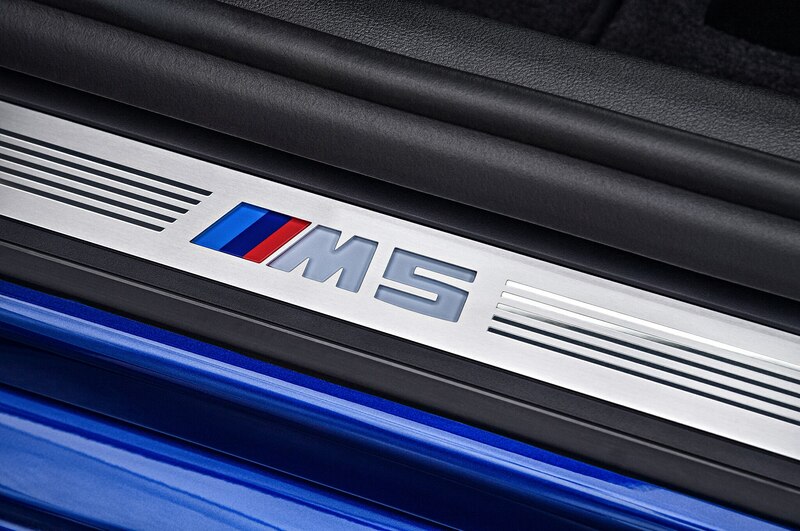 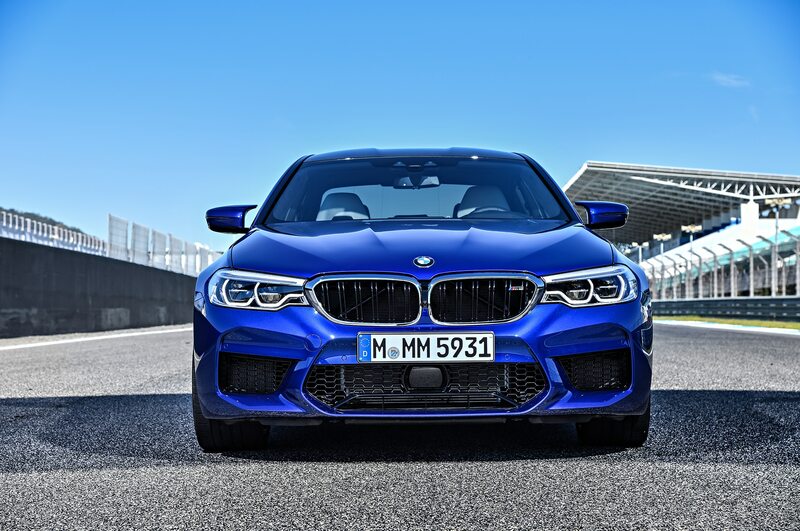 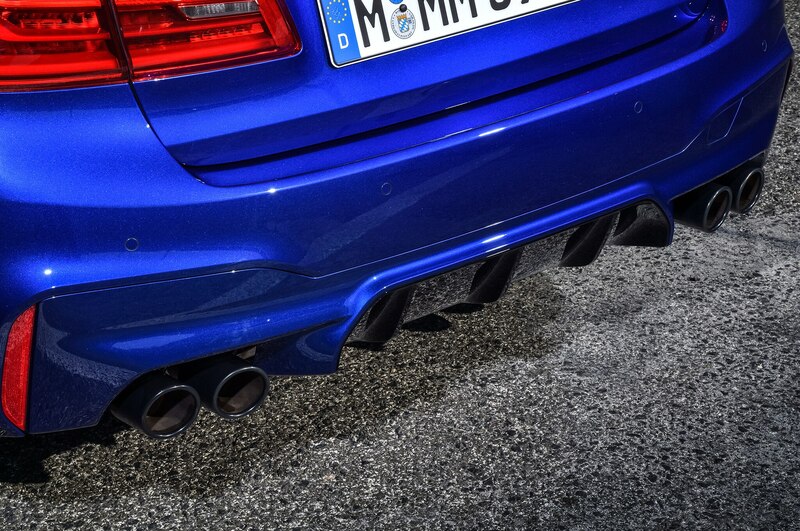 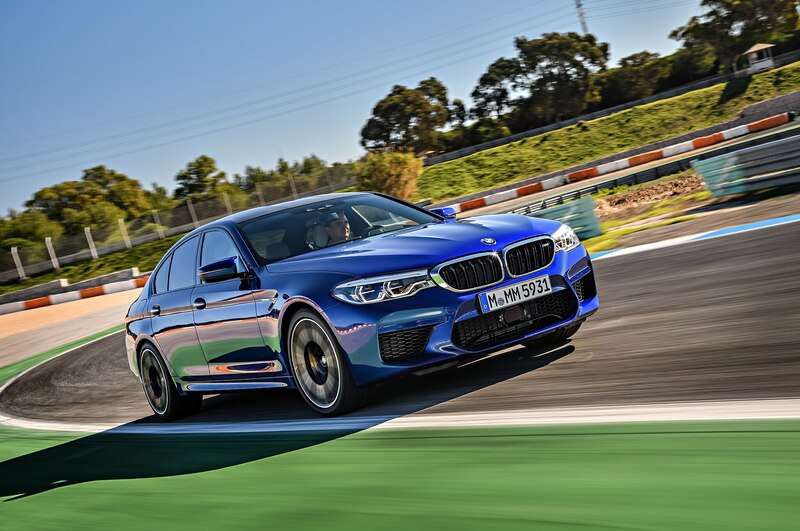 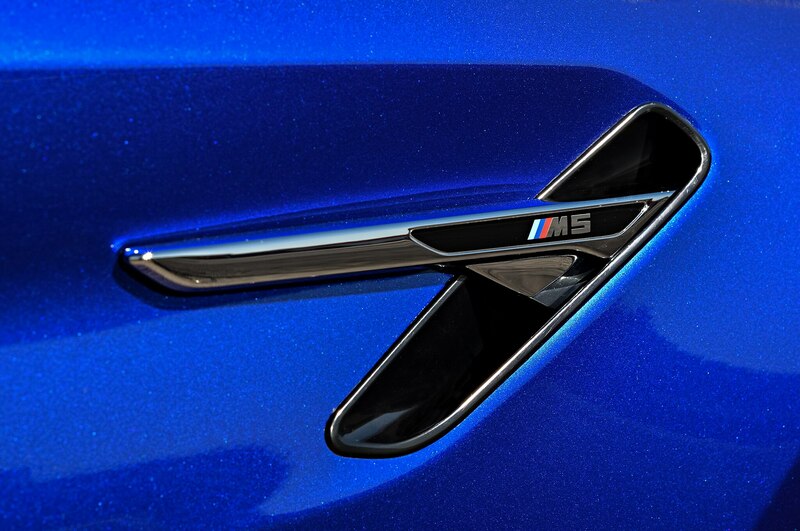 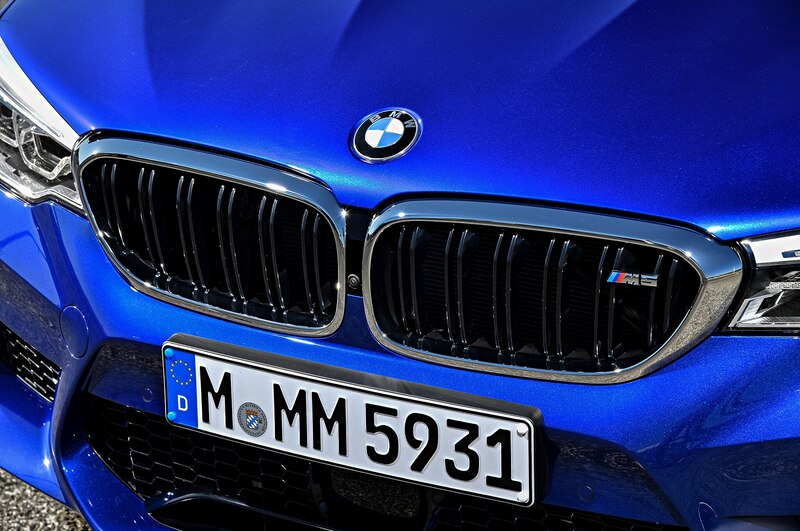 Now in its sixth generation, the mighty M5, which made its debut in 1984, is ready to rumble. 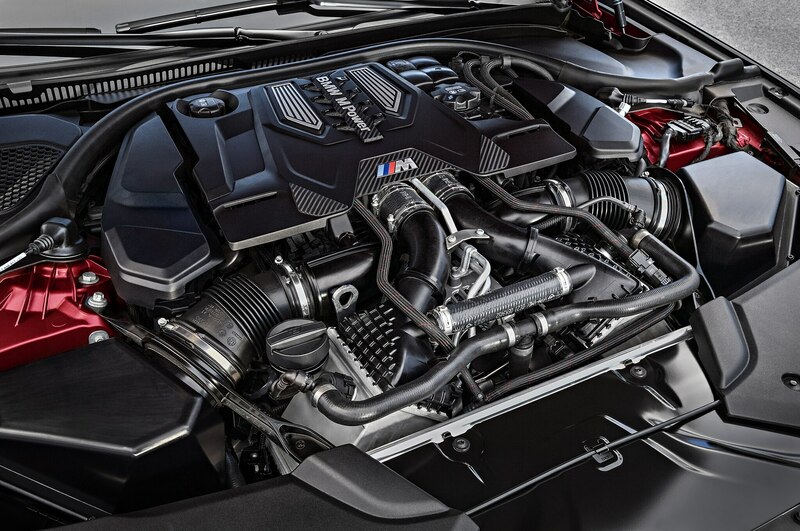 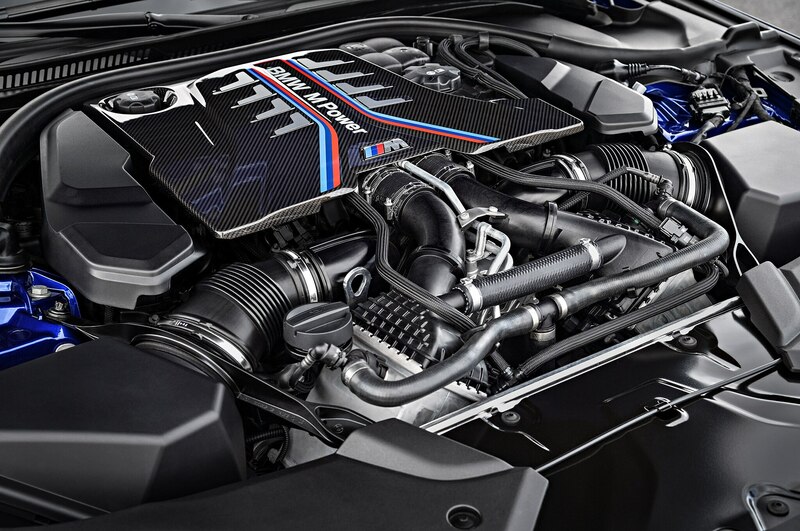 Under the hood, the 2018 BMW M5 packs a twin-turbo 4.4-liter V-8 engine with 600 hp and 553 lb-ft of torque, a 40 hp and 53 lb-ft bump over the old version. 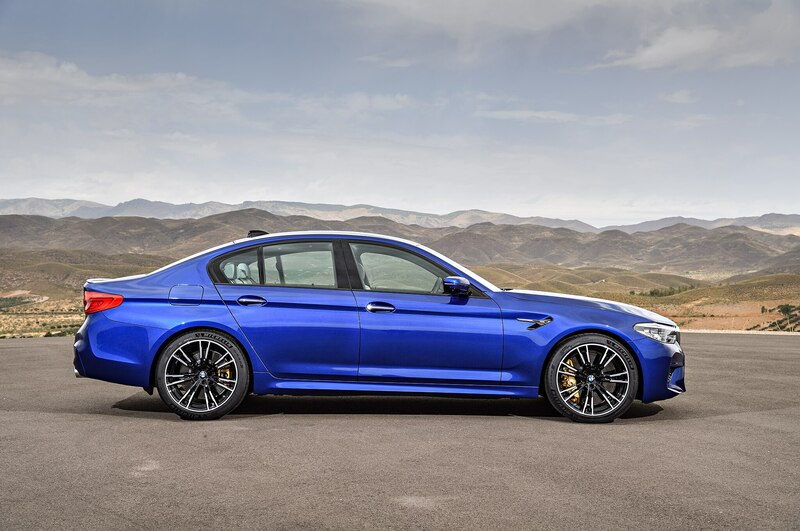 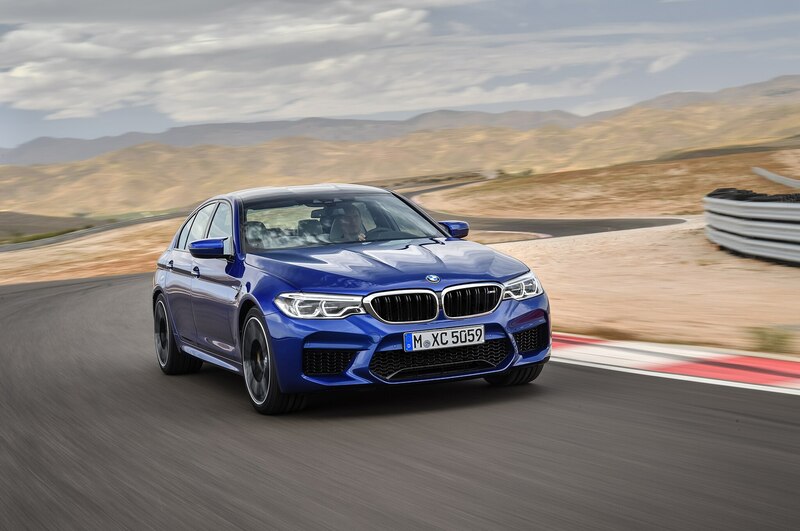 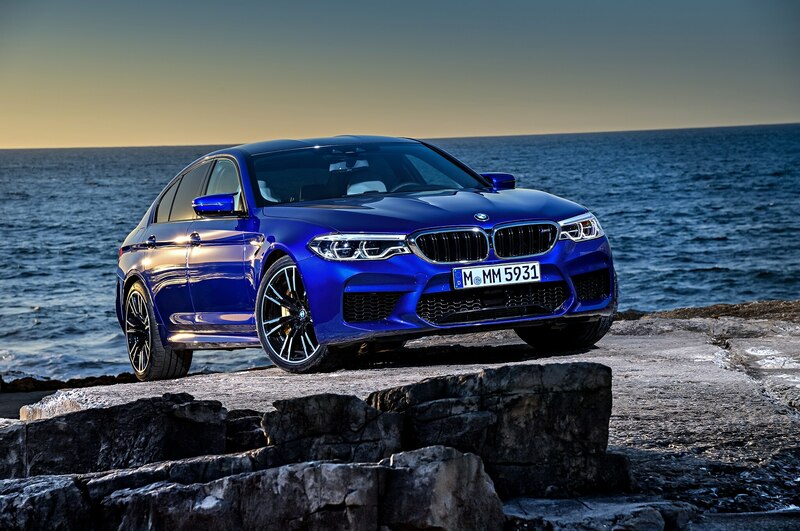 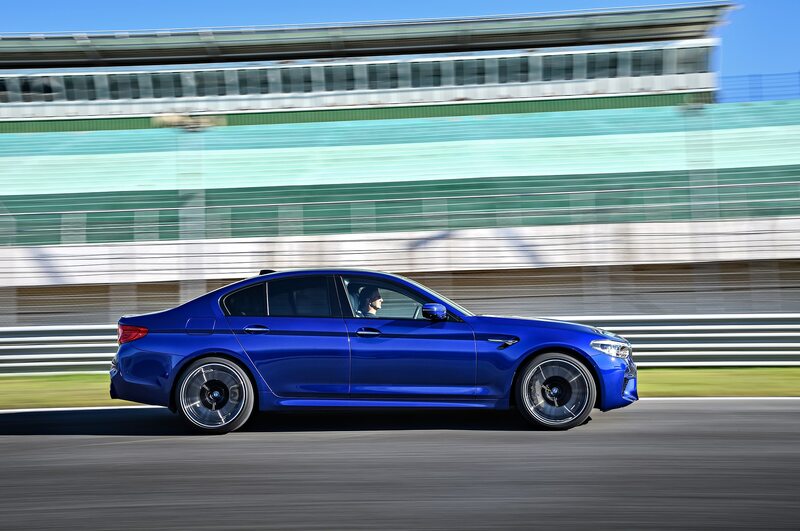 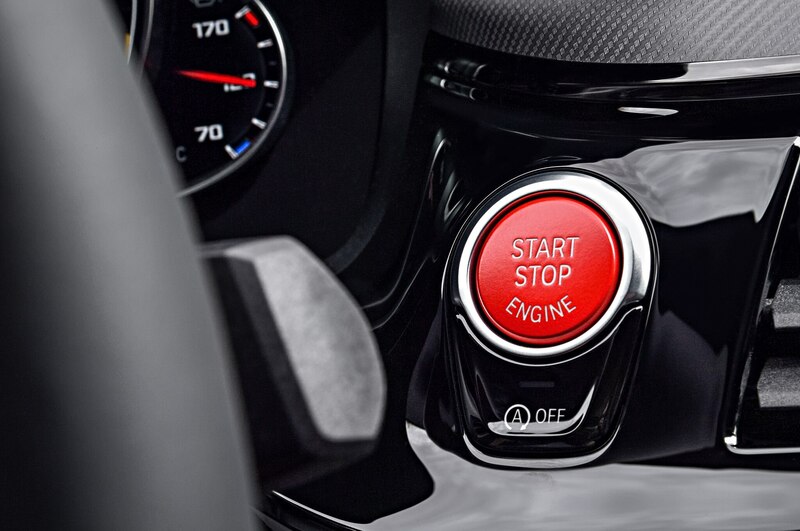 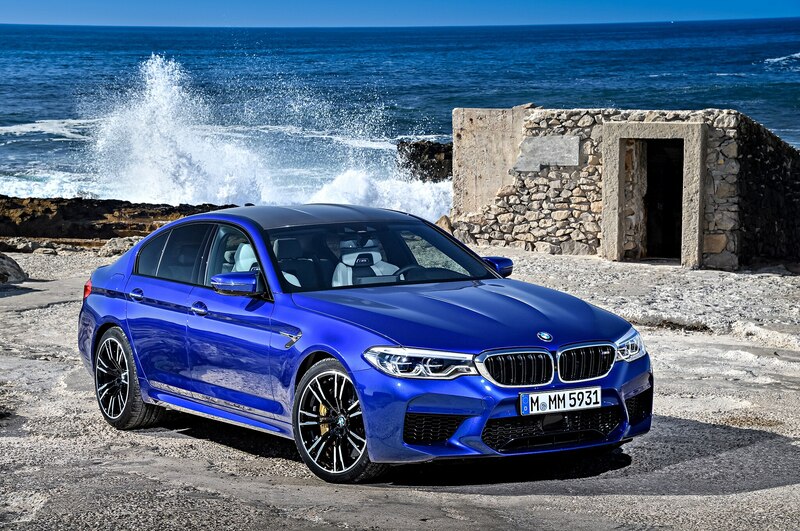 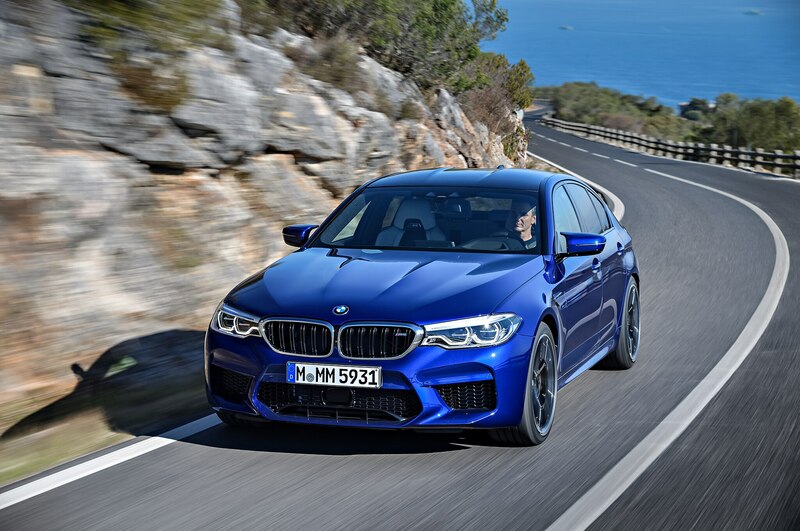 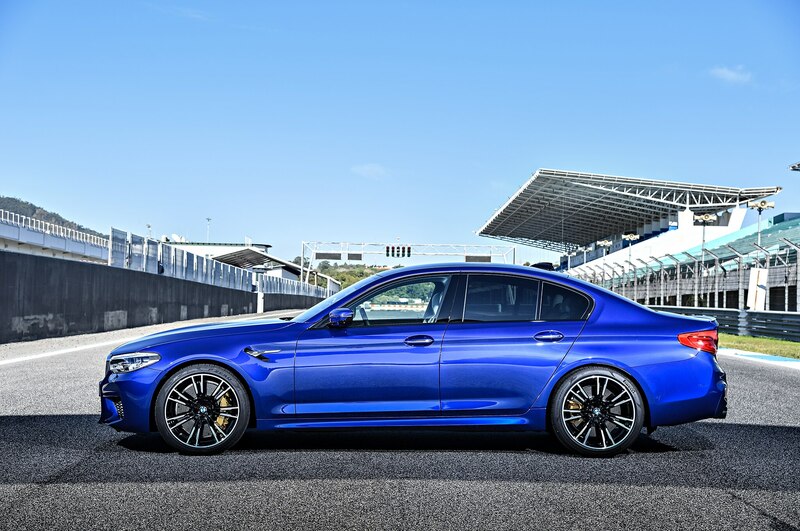 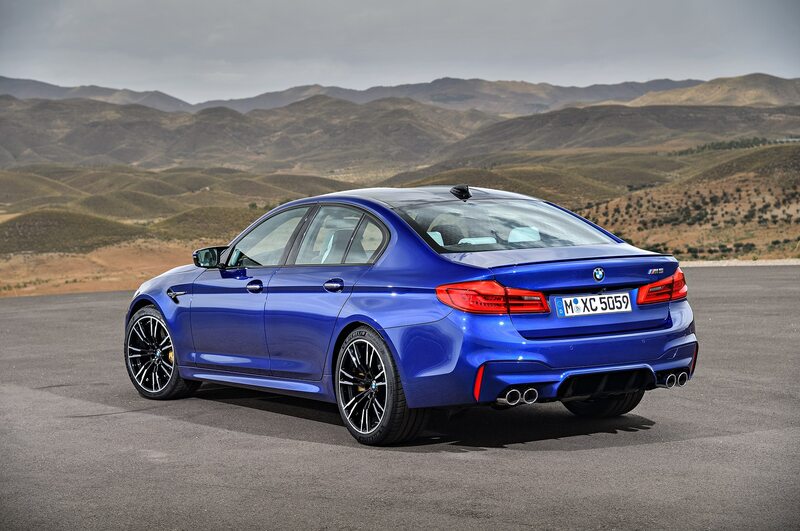 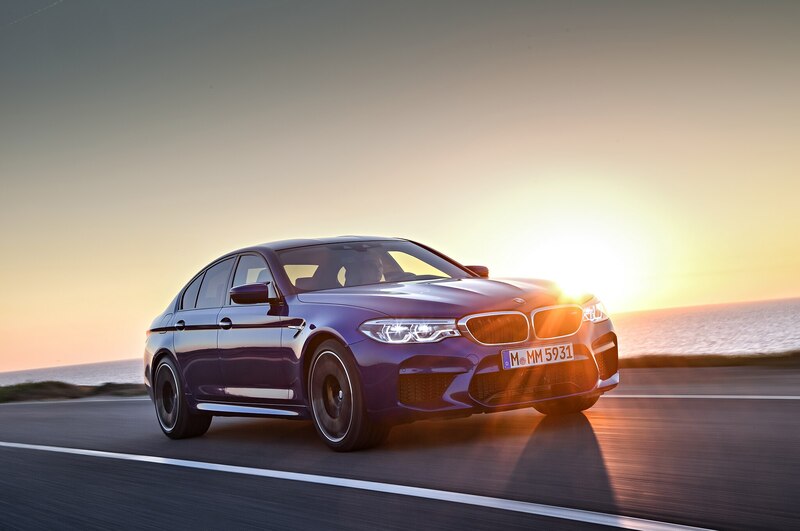 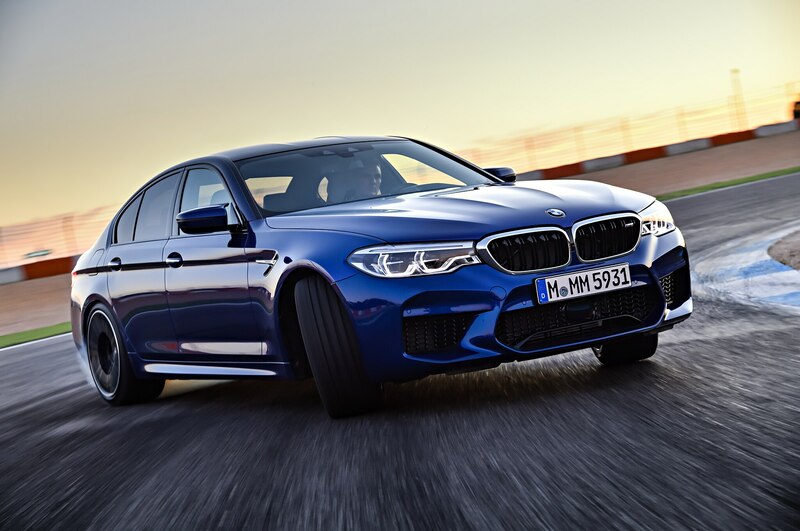 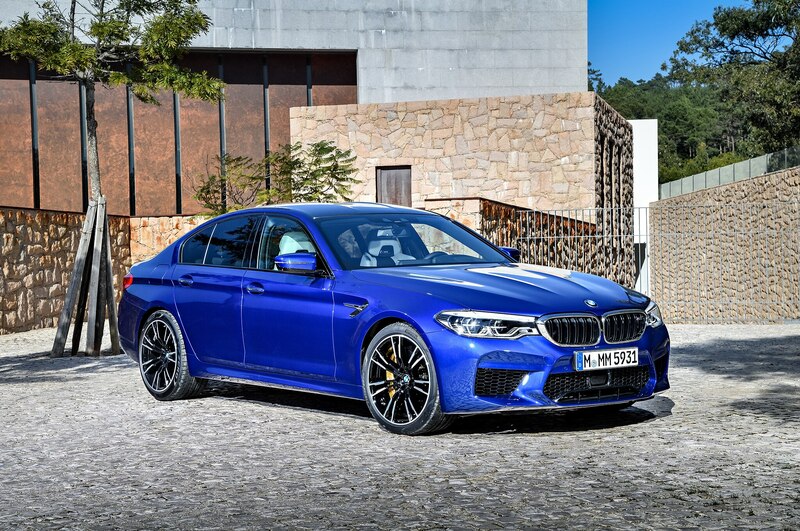 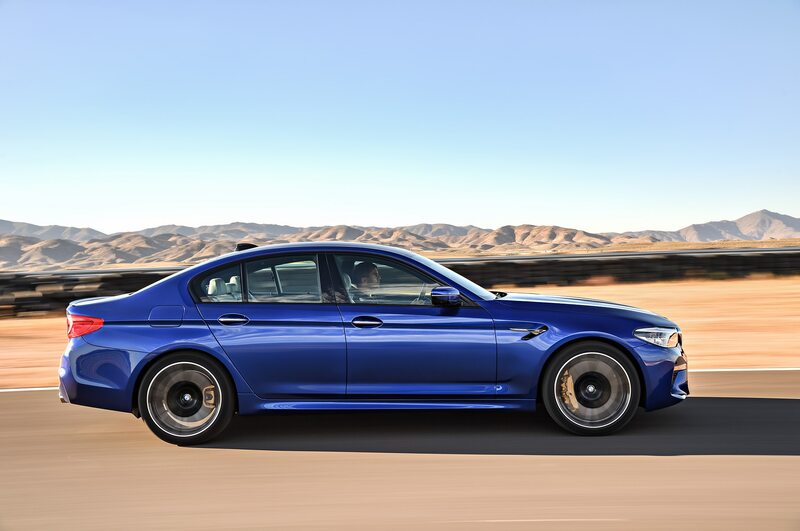 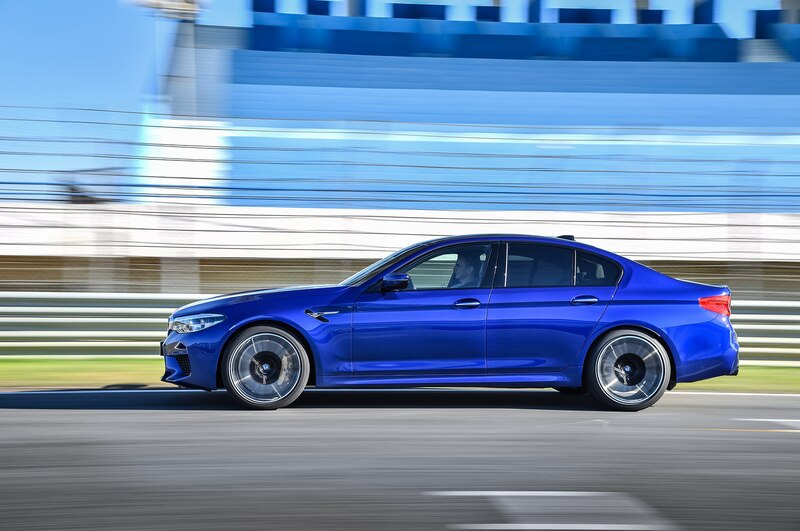 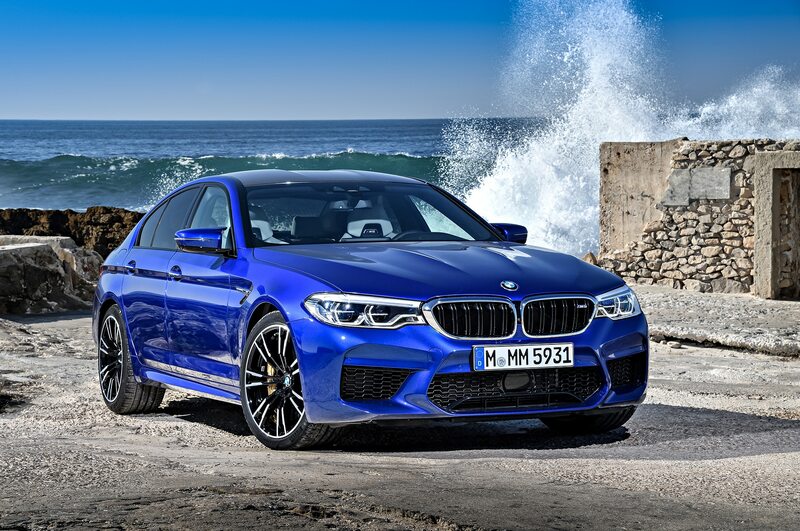 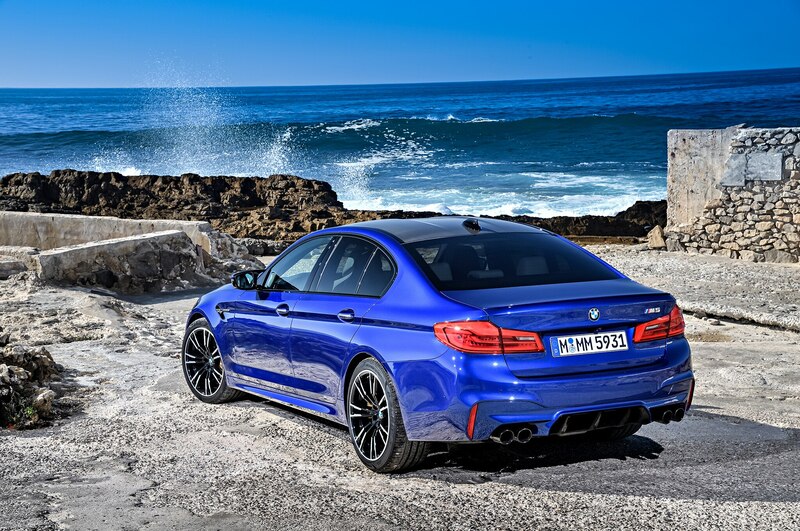 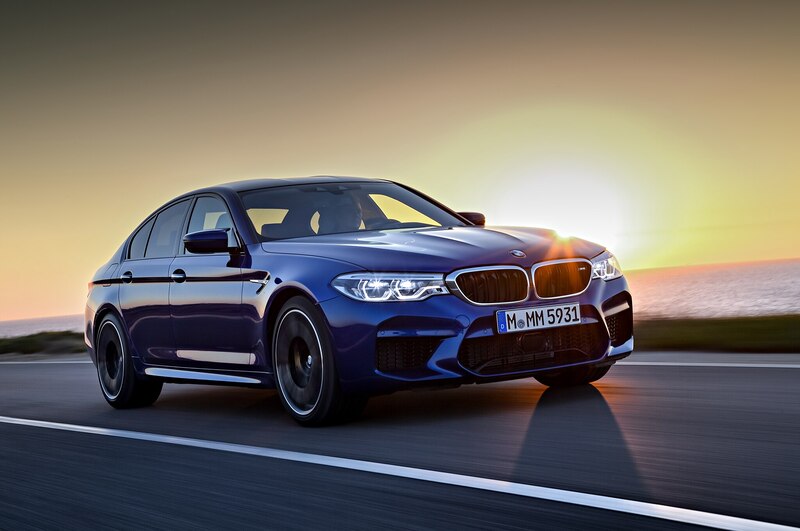 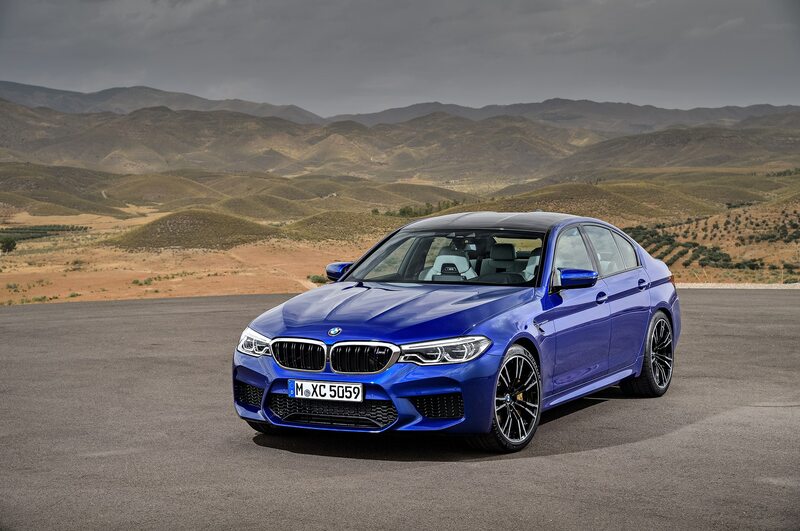 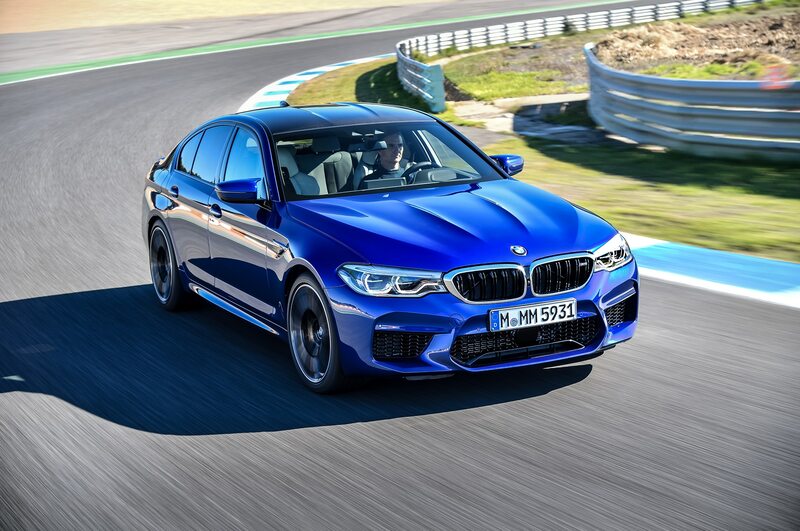 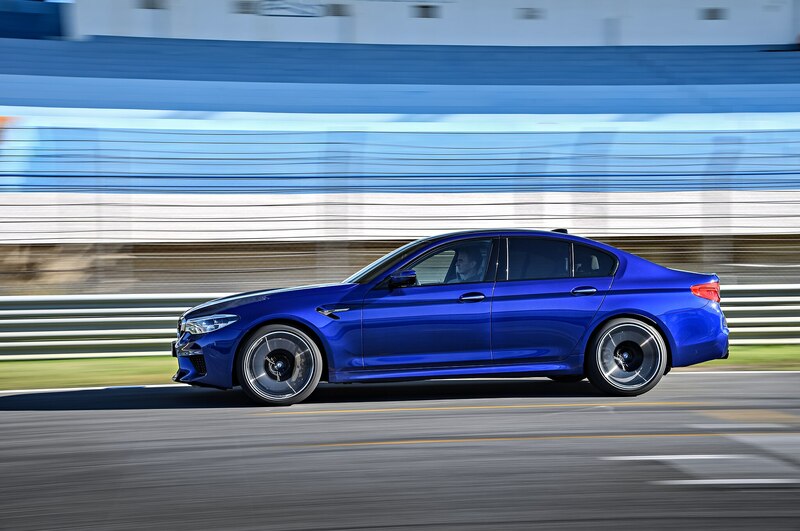 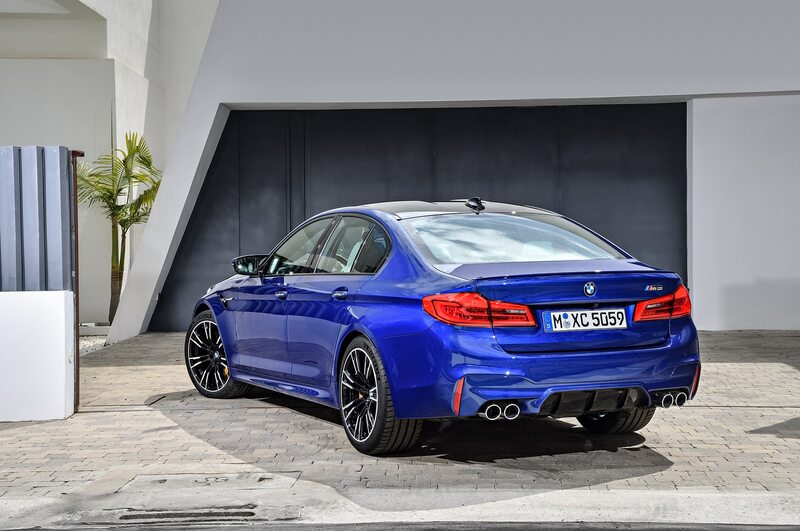 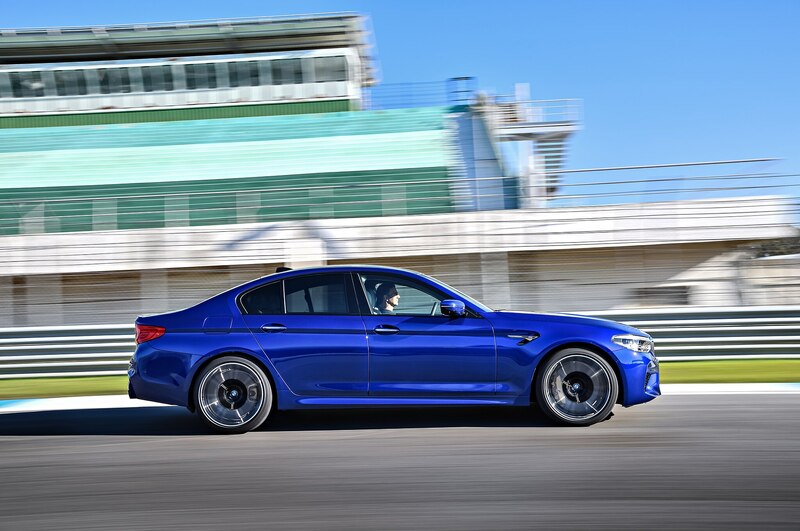 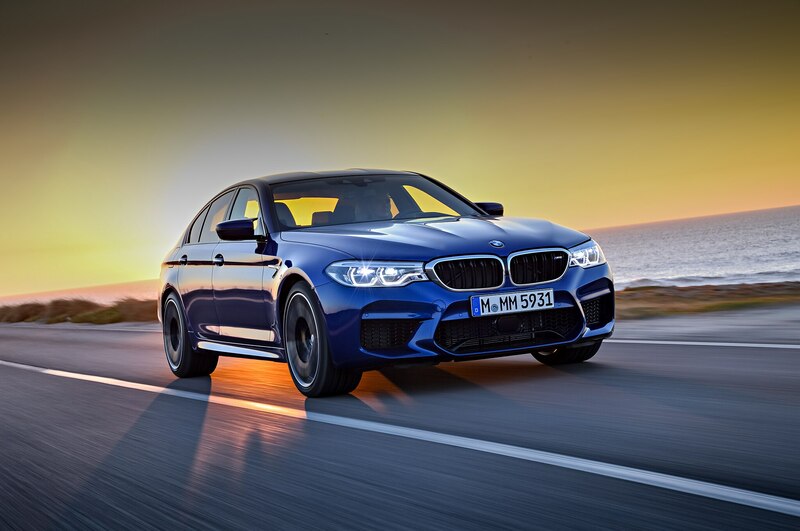 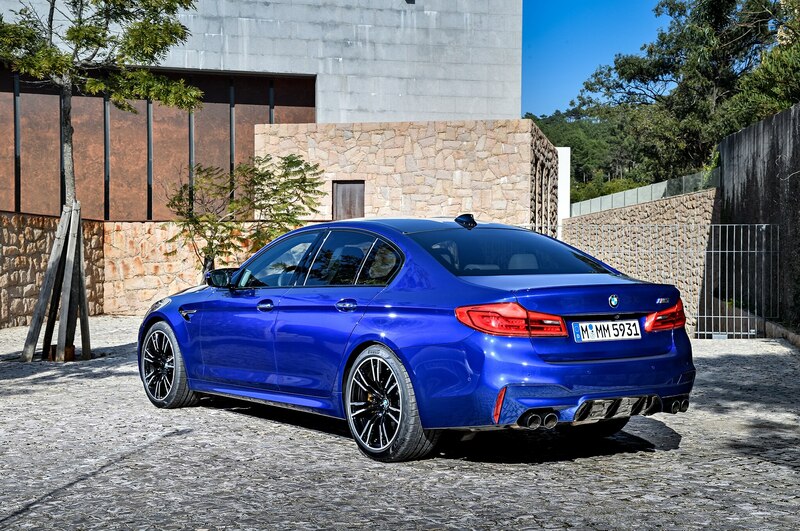 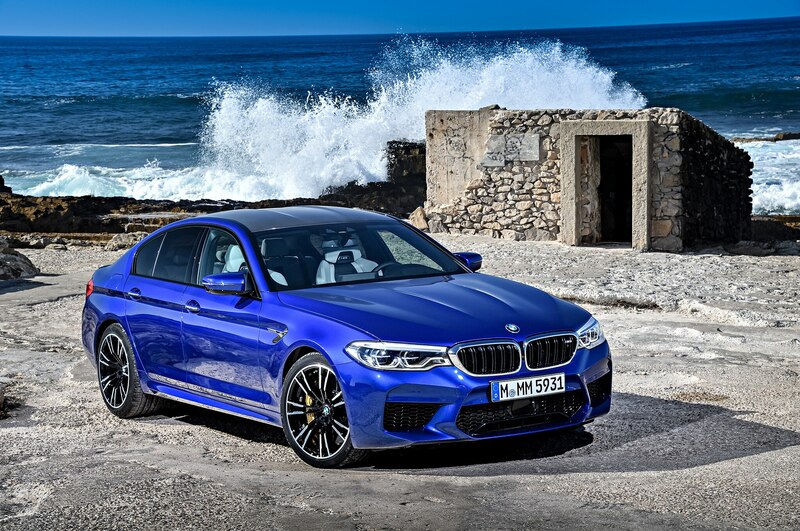 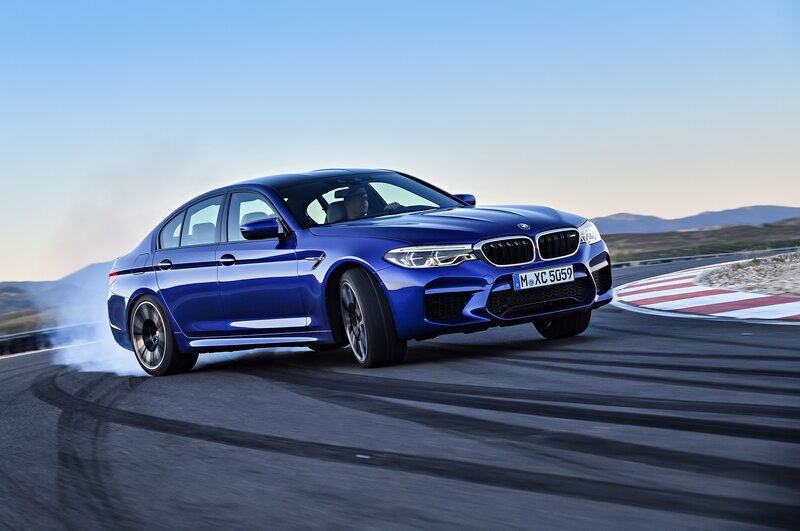 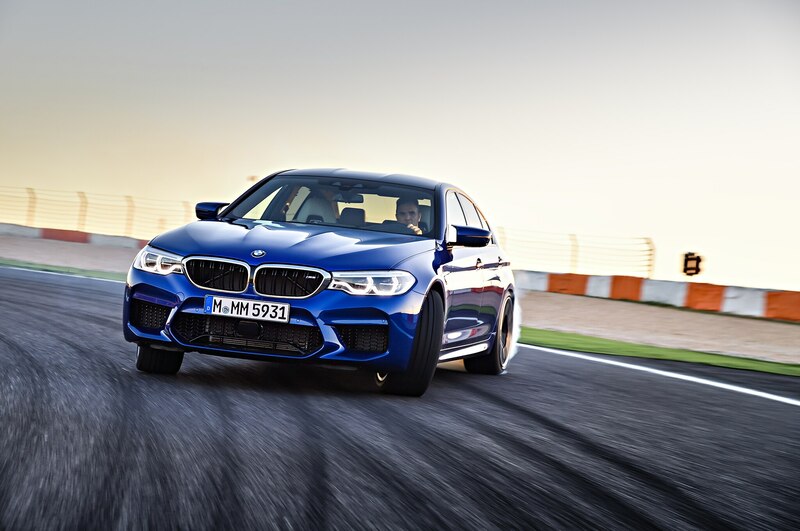 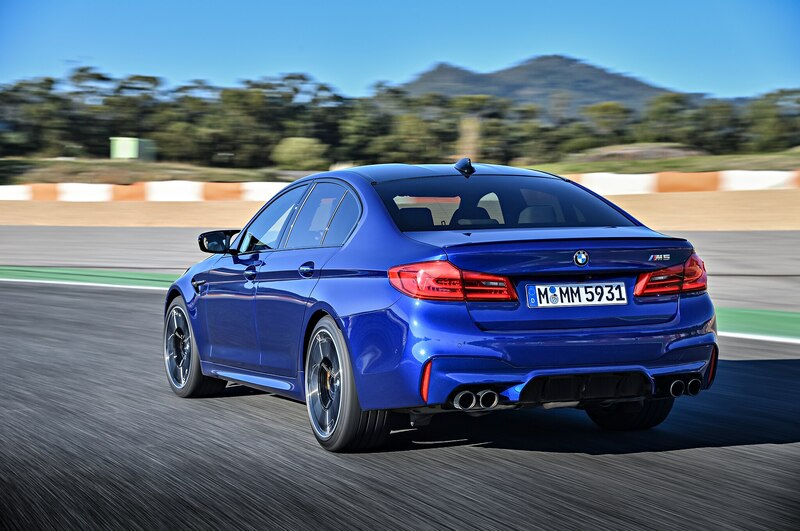 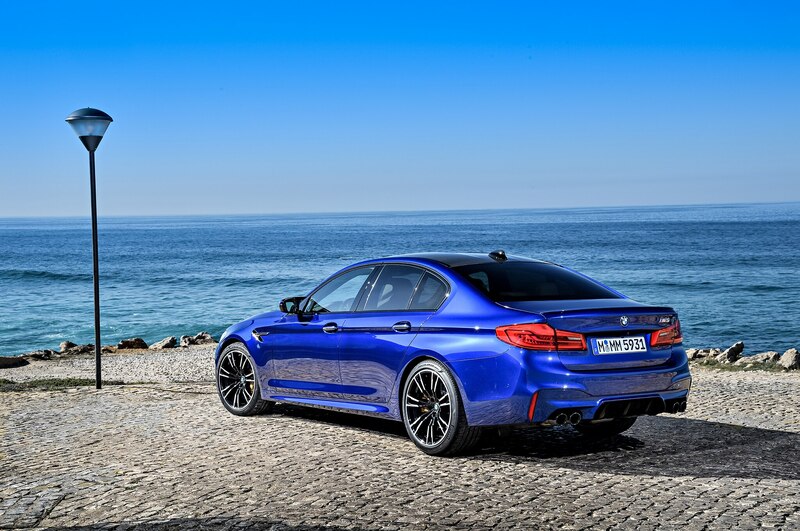 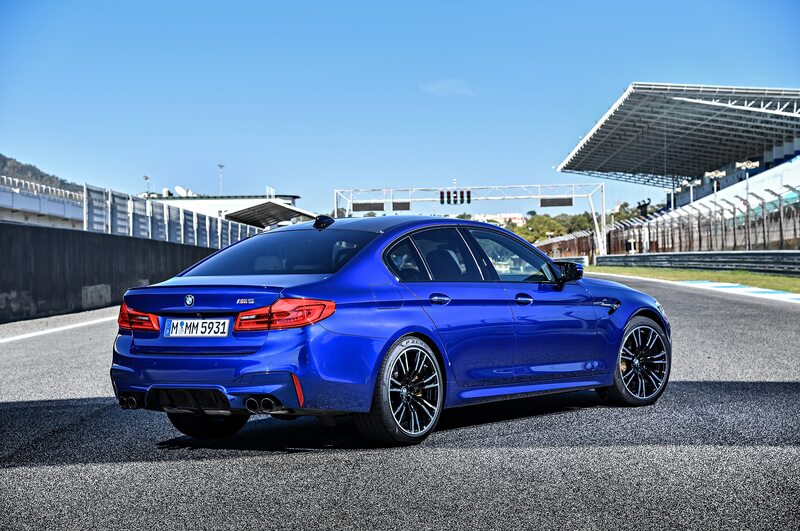 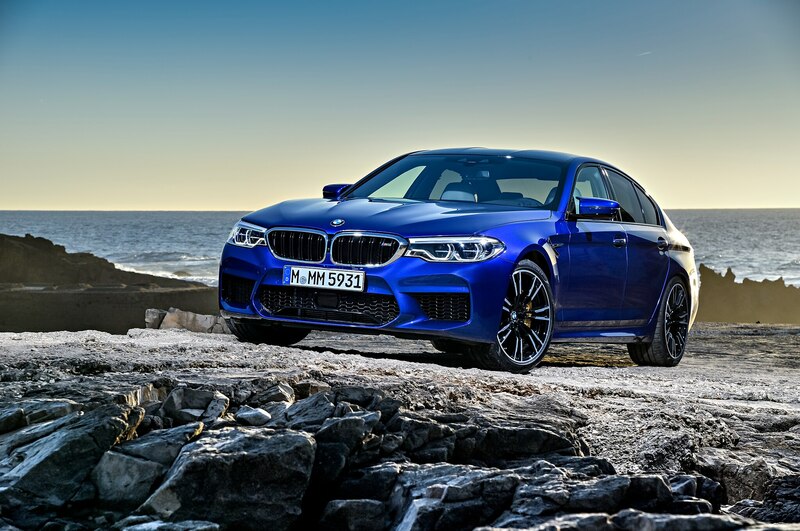 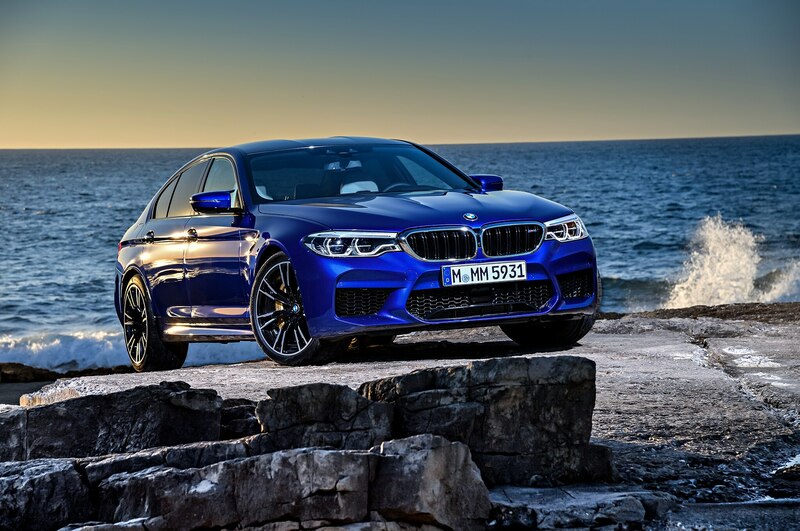 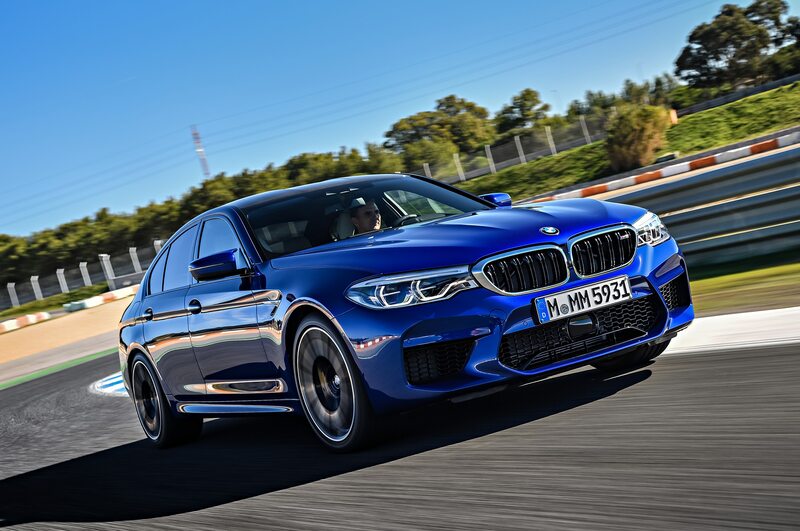 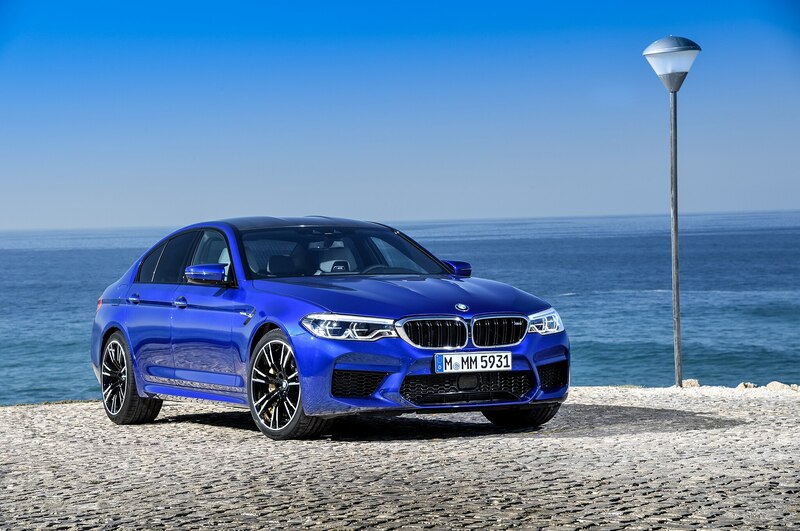 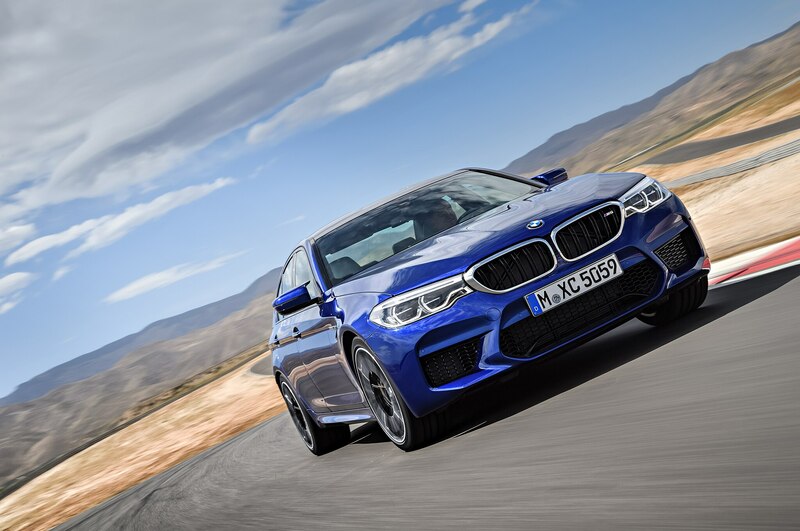 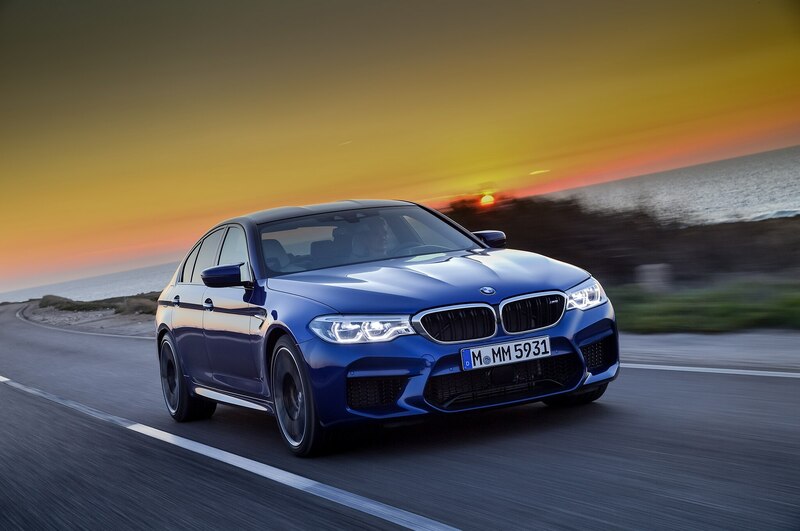 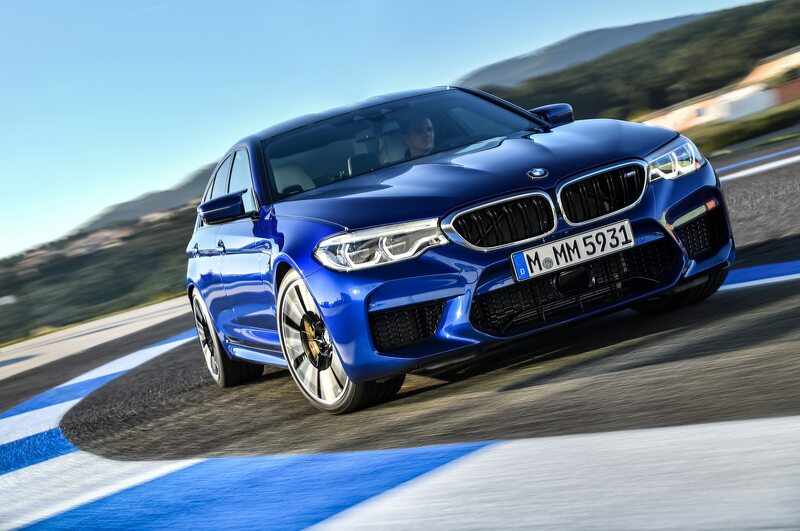 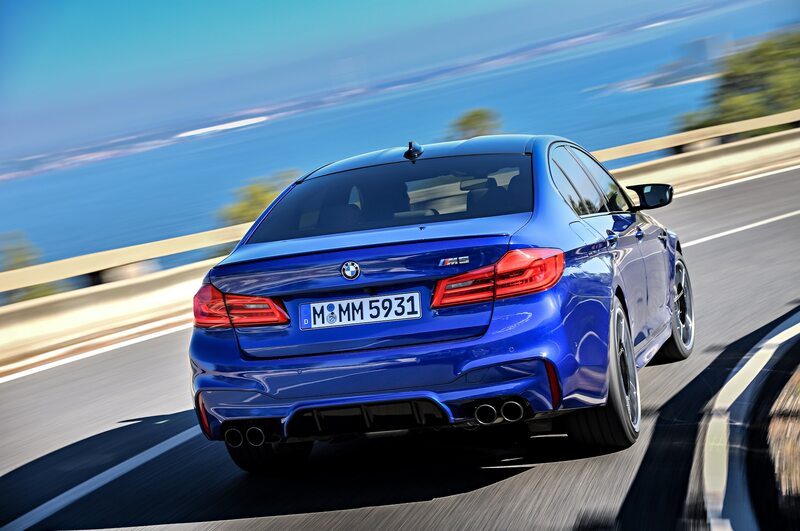 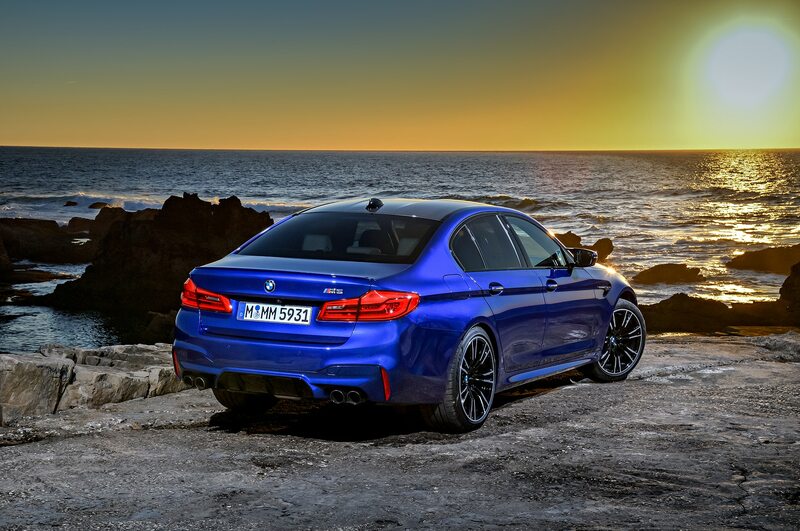 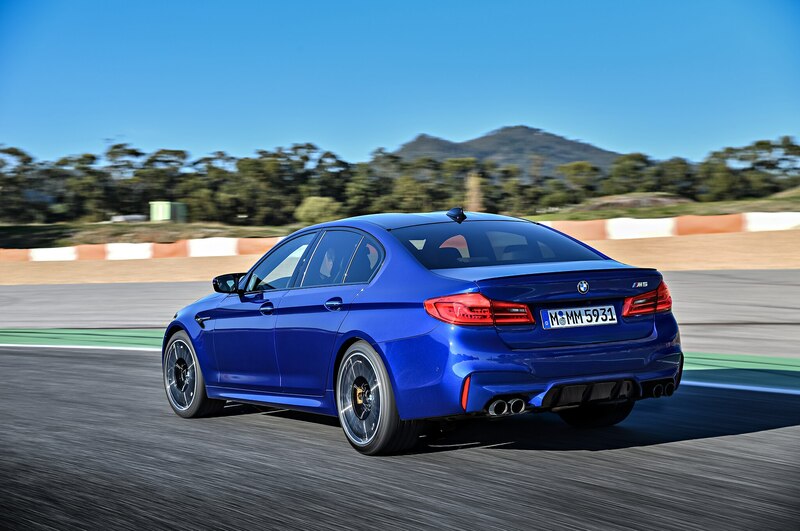 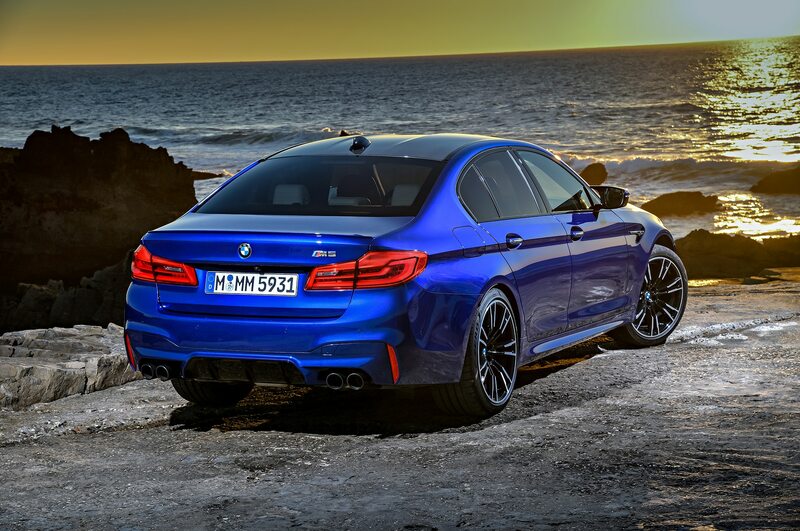 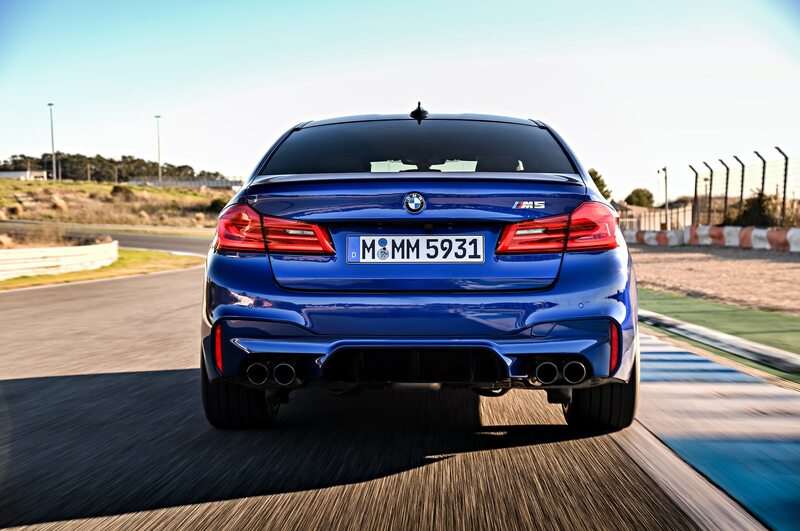 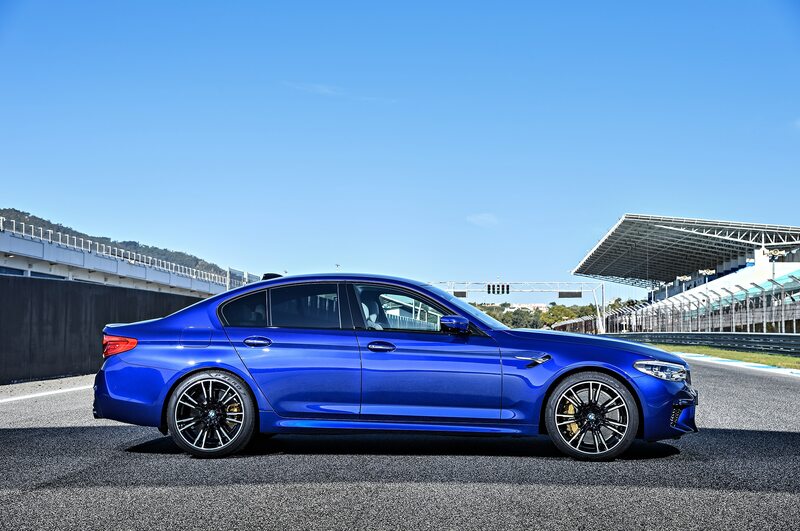 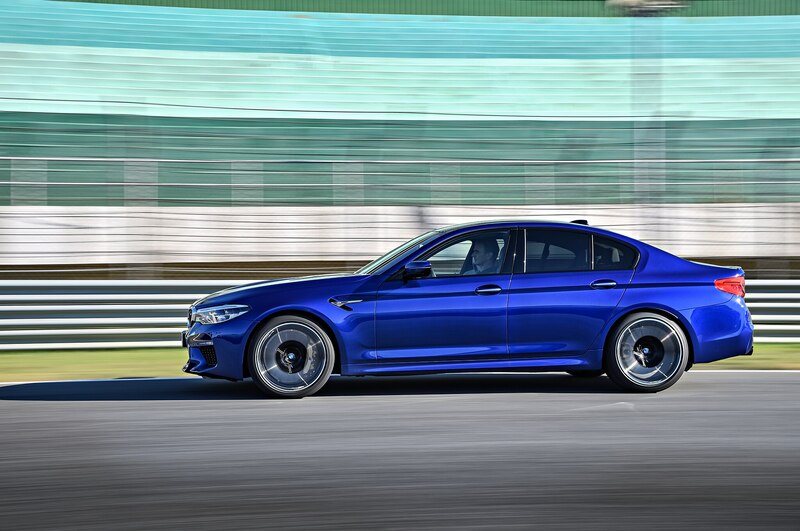 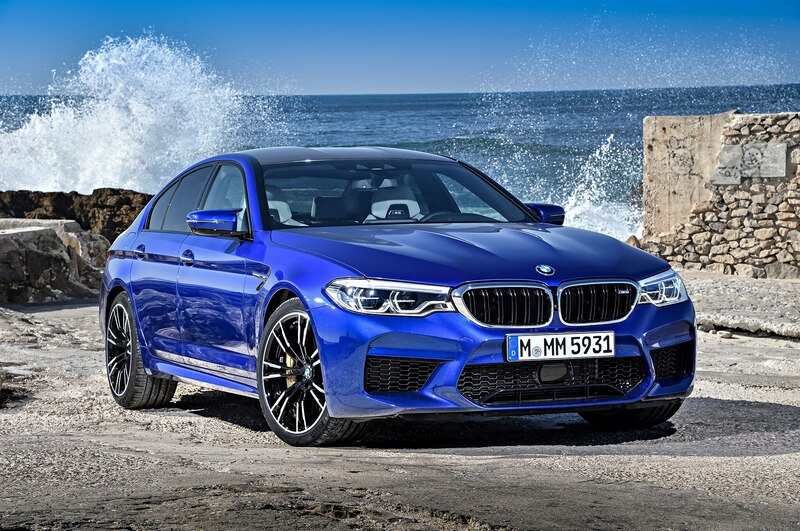 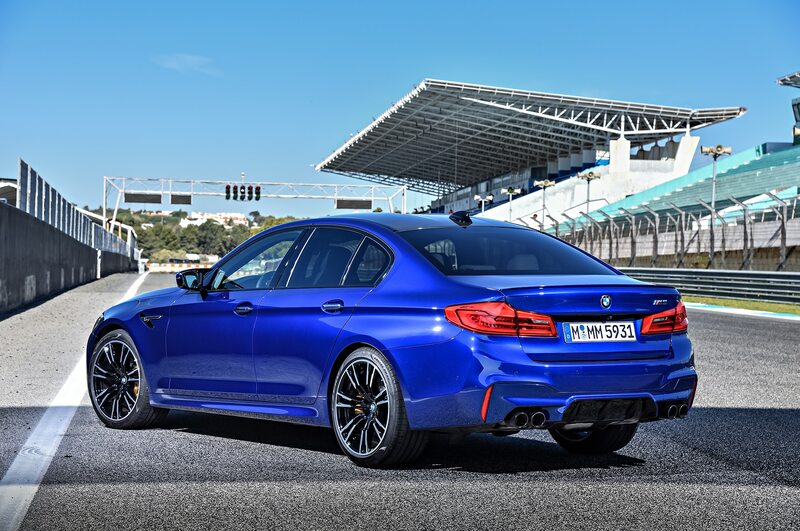 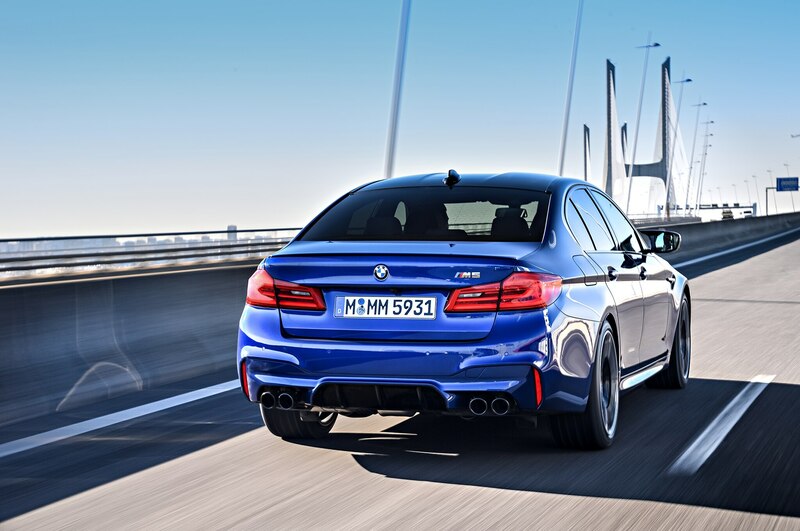 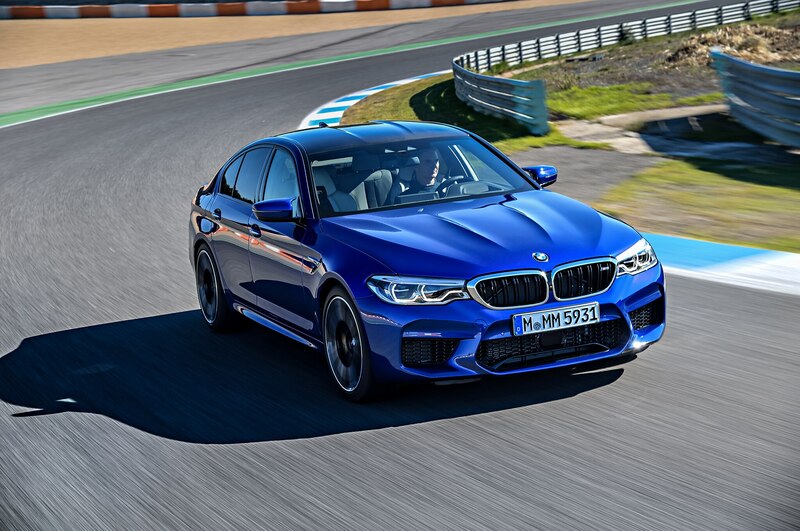 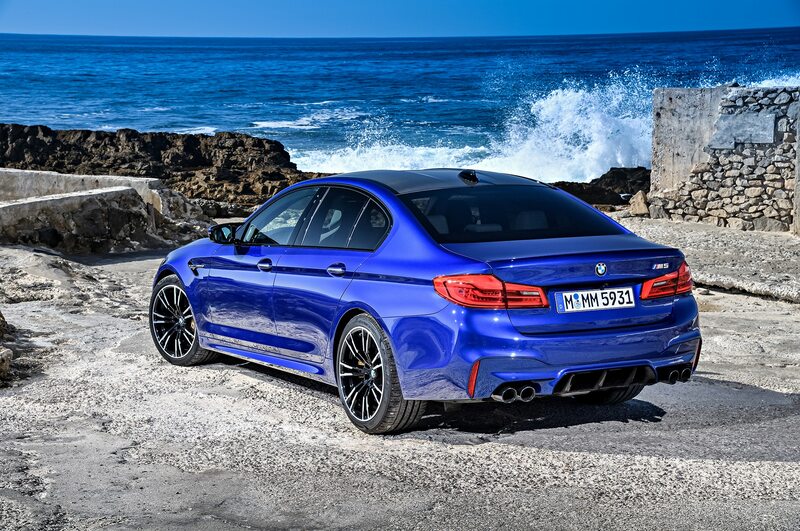 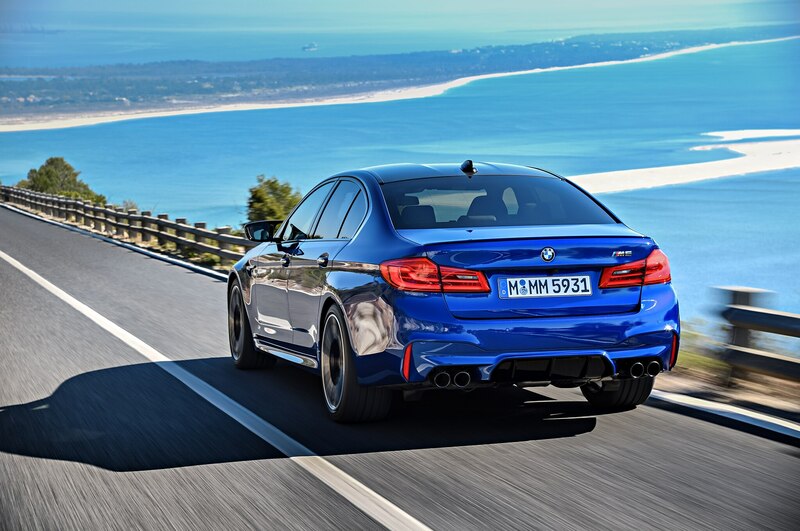 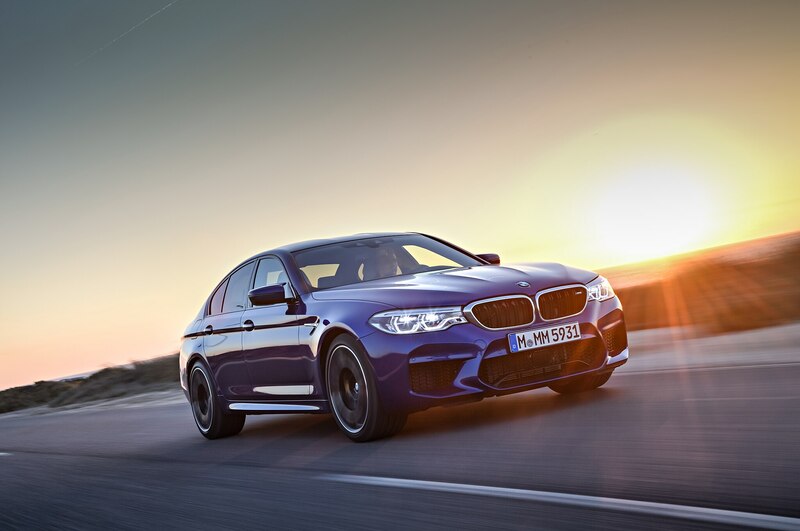 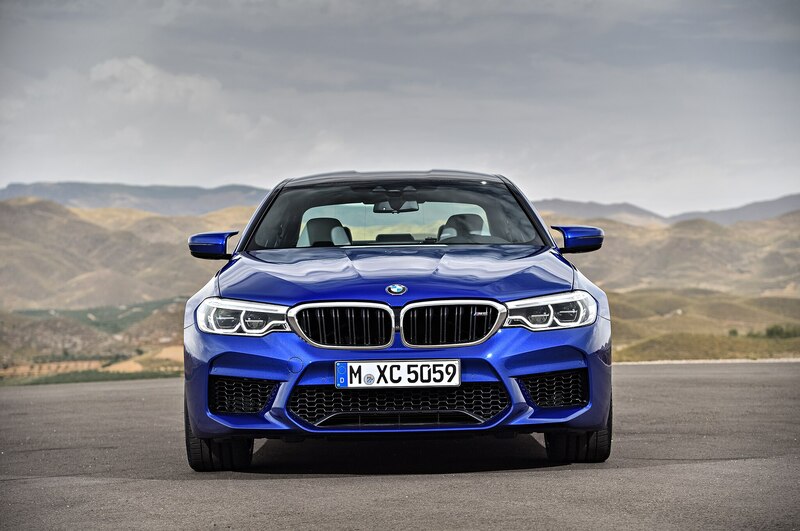 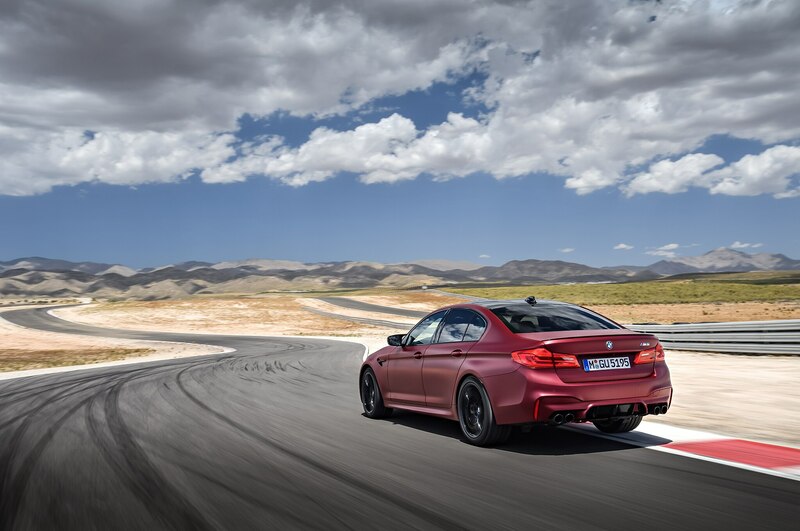 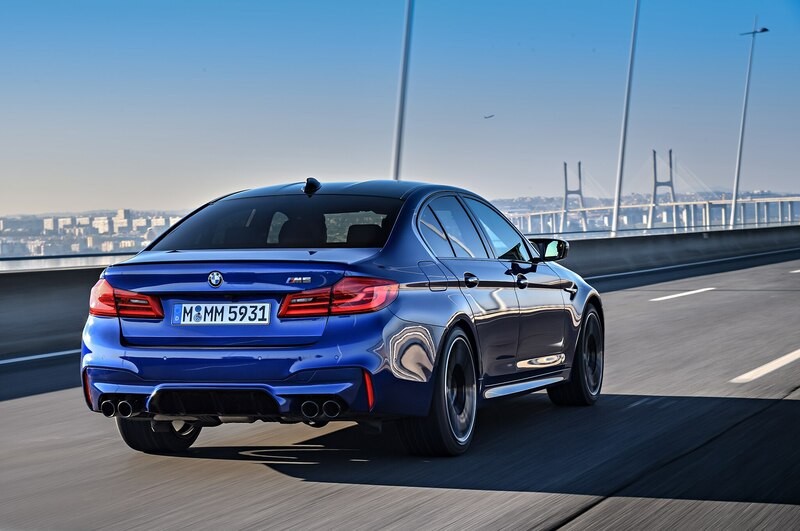 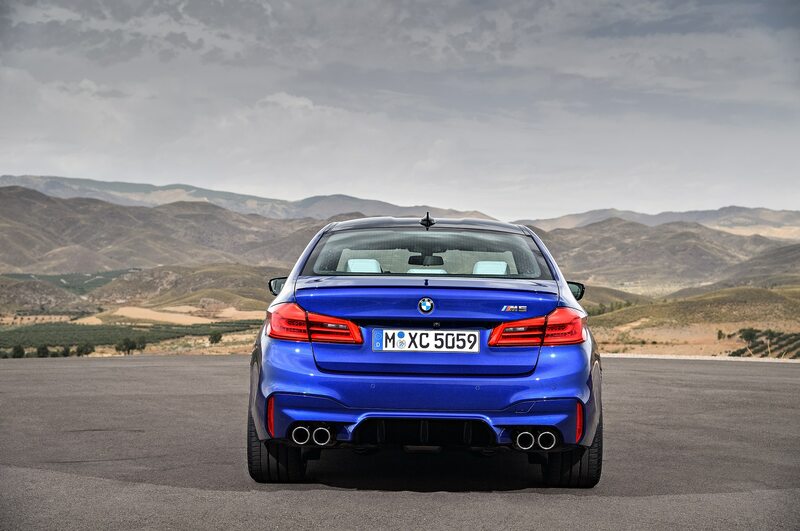 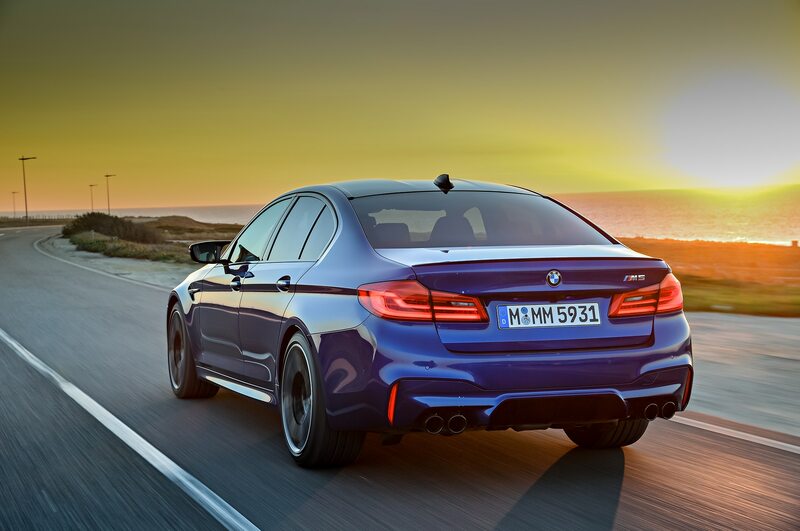 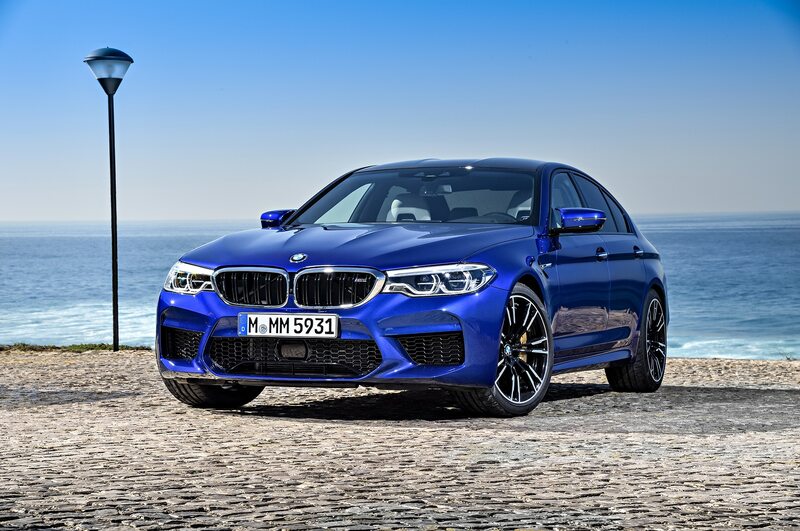 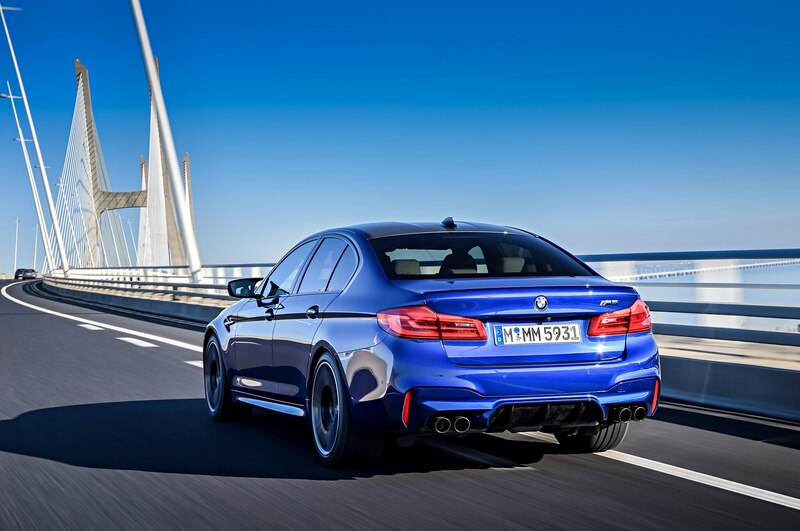 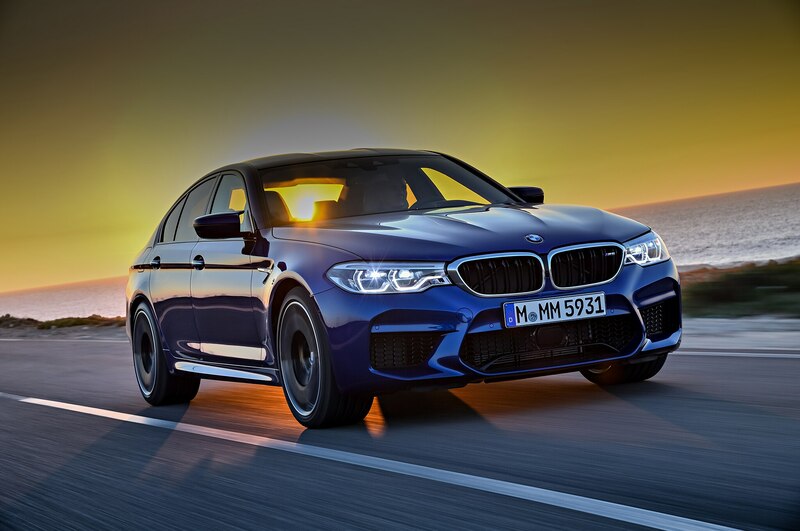 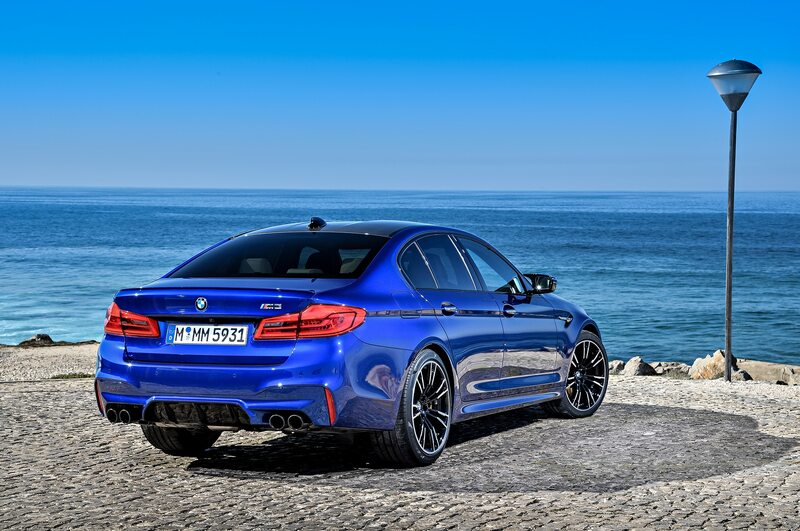 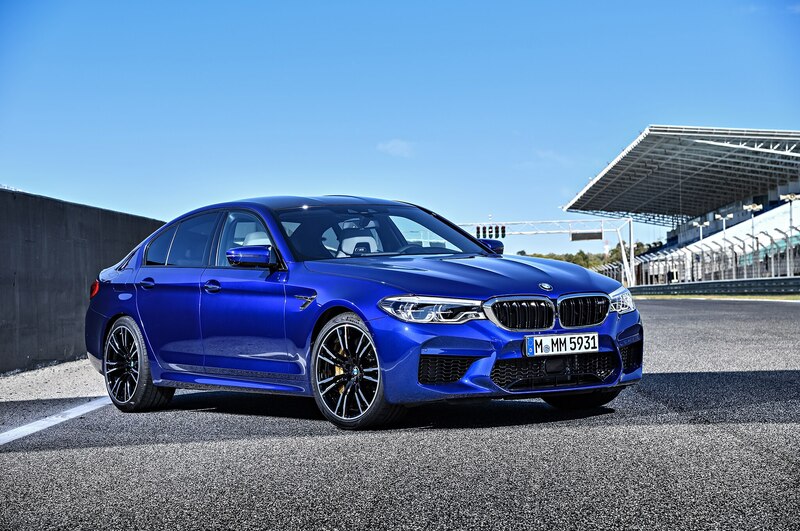 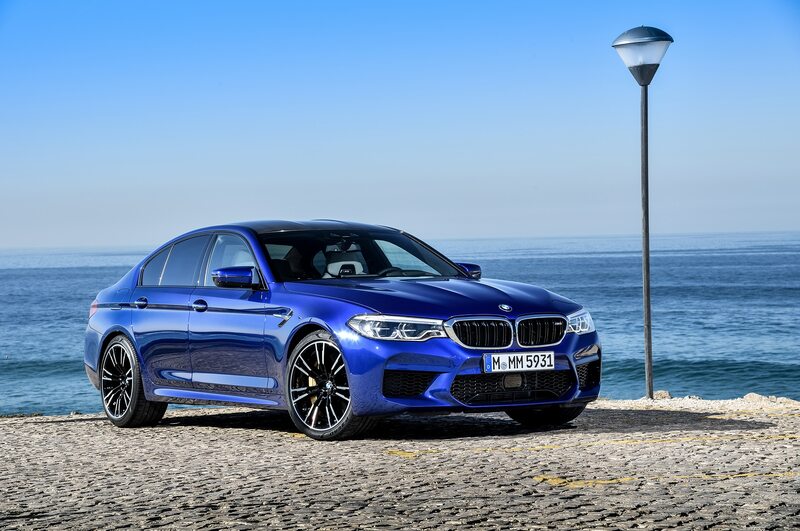 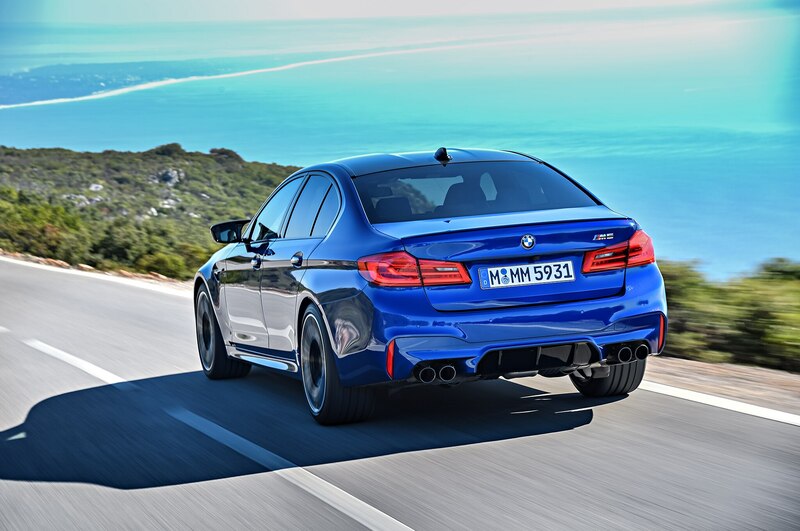 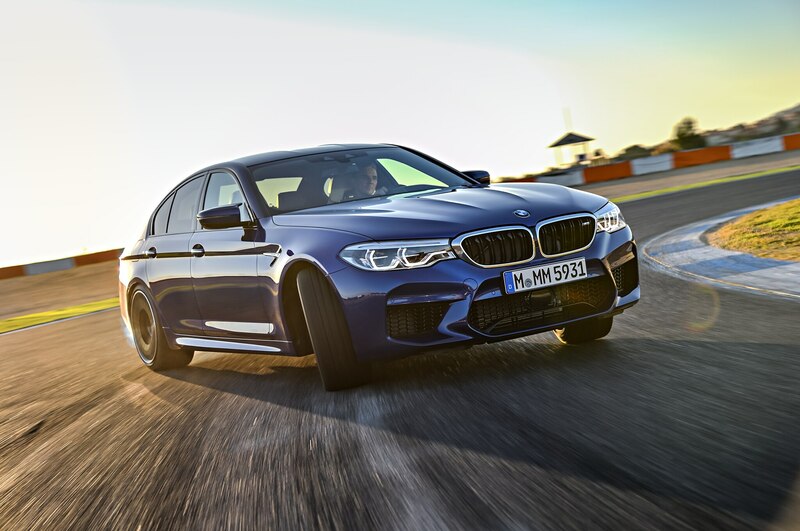 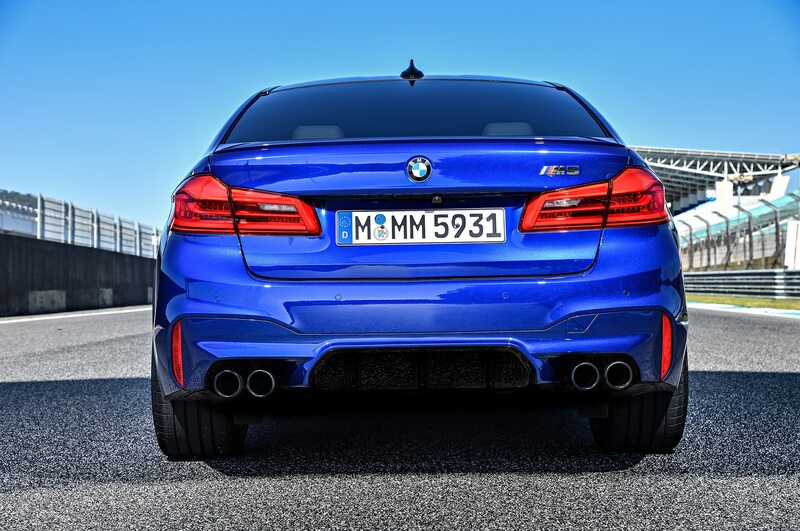 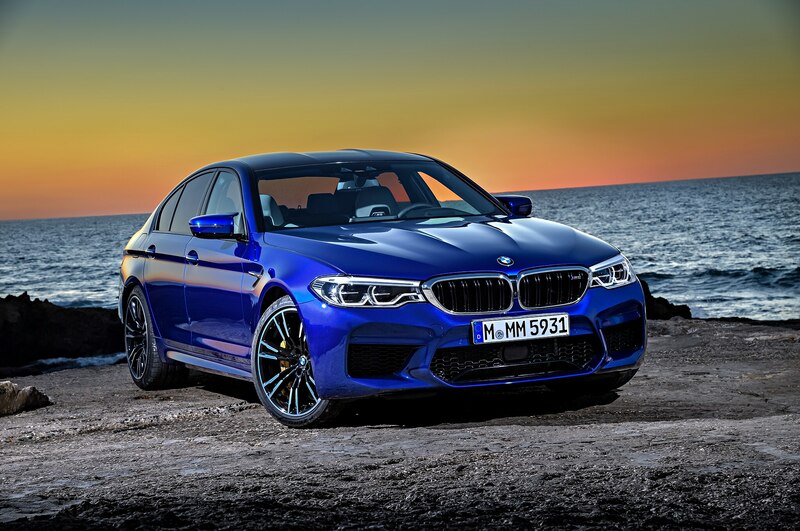 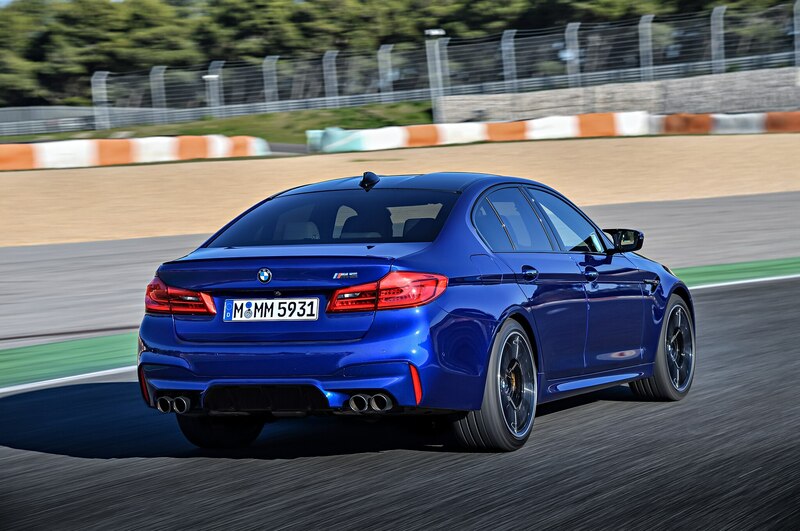 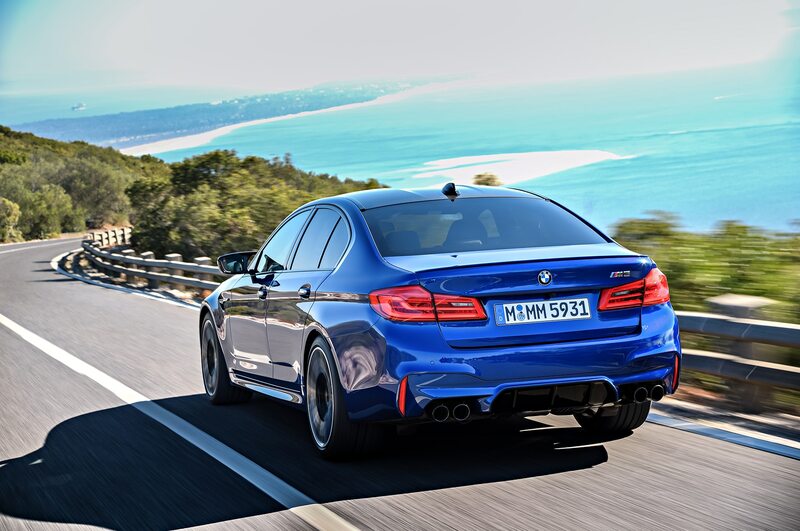 The F10 M5’s seven-speed DCT was ditched for a new 8-speed M Steptronic automatic transmission. 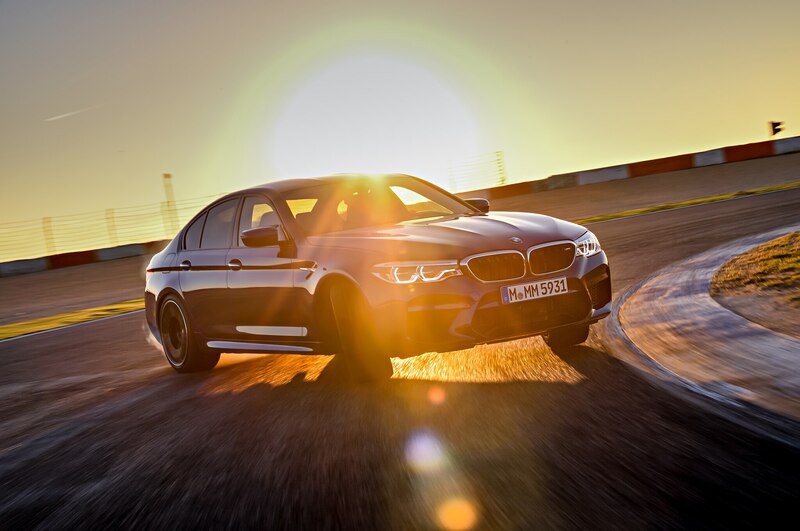 BMW’s M xDrive system promises a 0–60 mph run in 3.2 seconds. 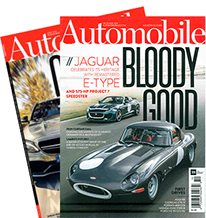 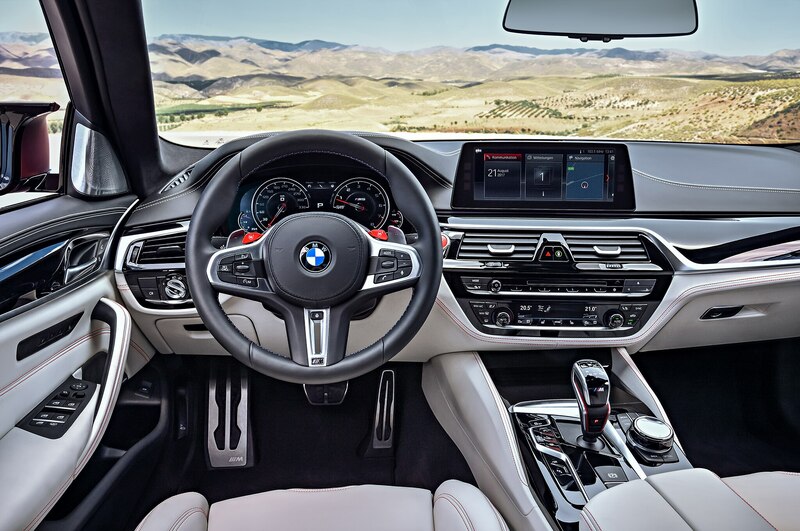 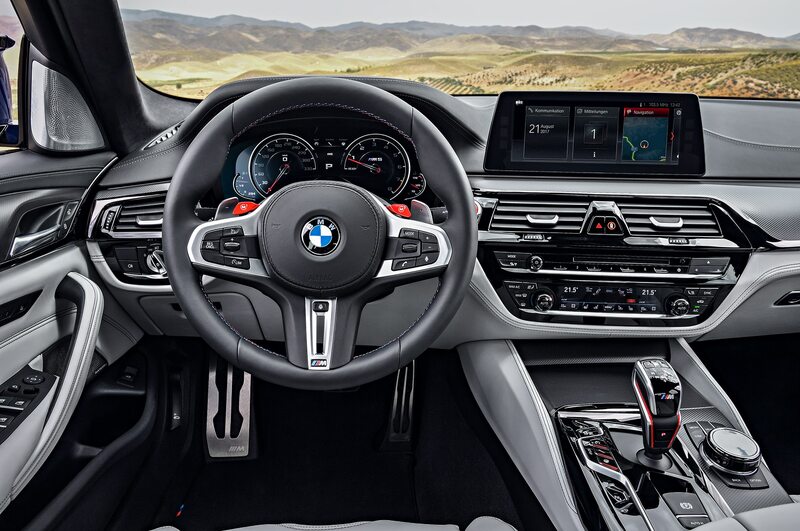 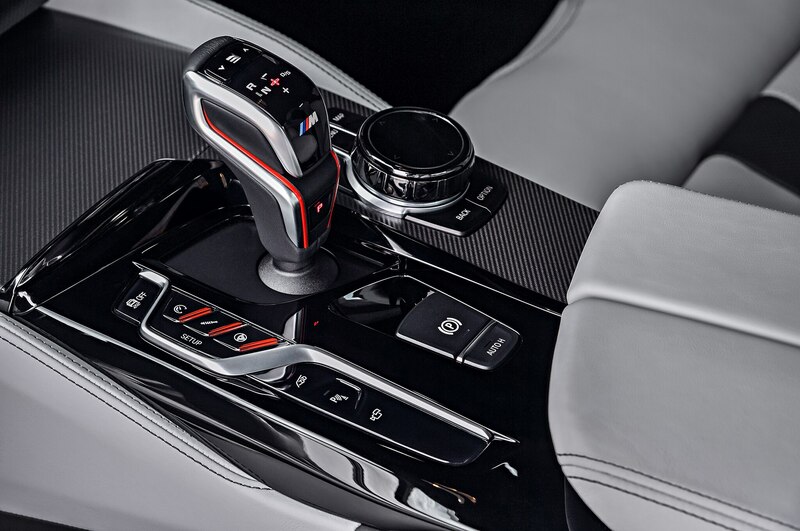 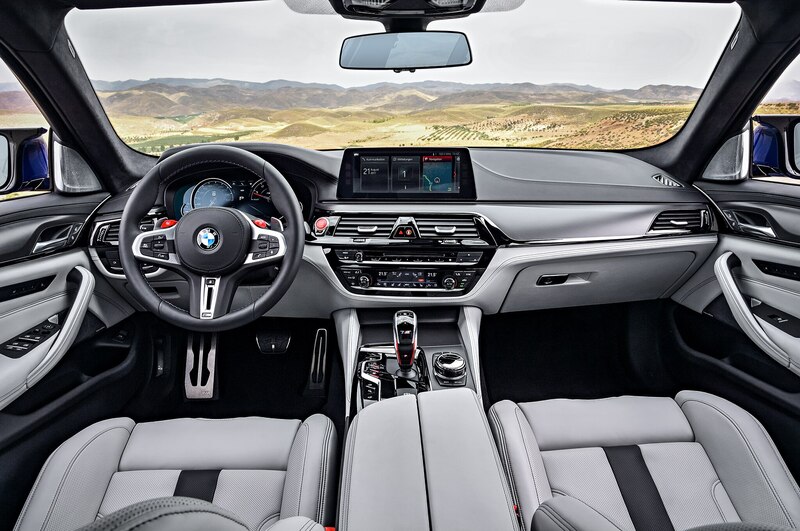 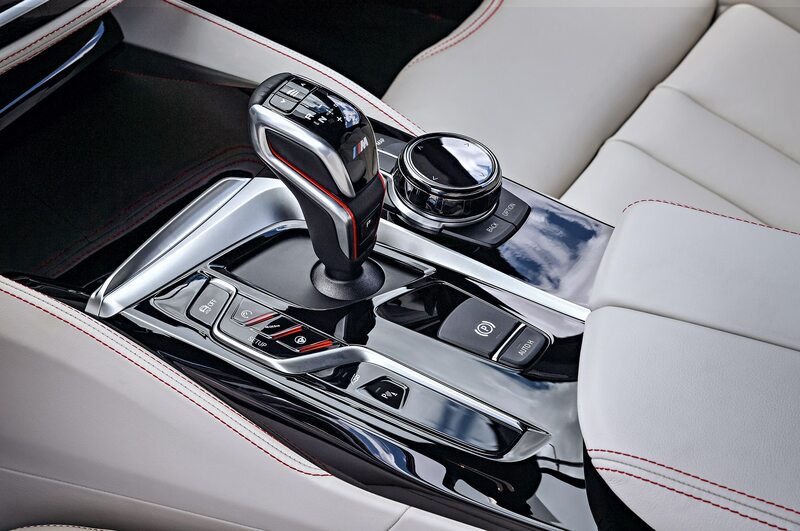 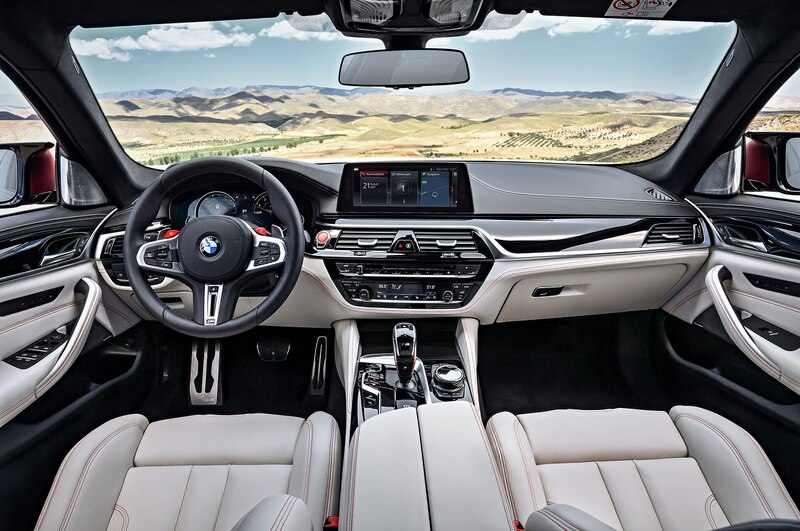 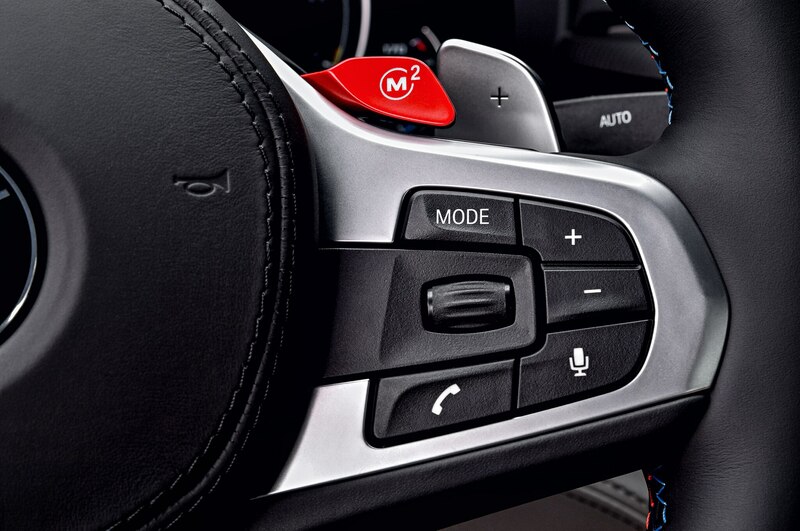 Drivers can choose between fully automatic shifting in D mode, or opt for sequential gearshifts via the new short gear selector on the center console—or the M shift paddles on the steering wheel. 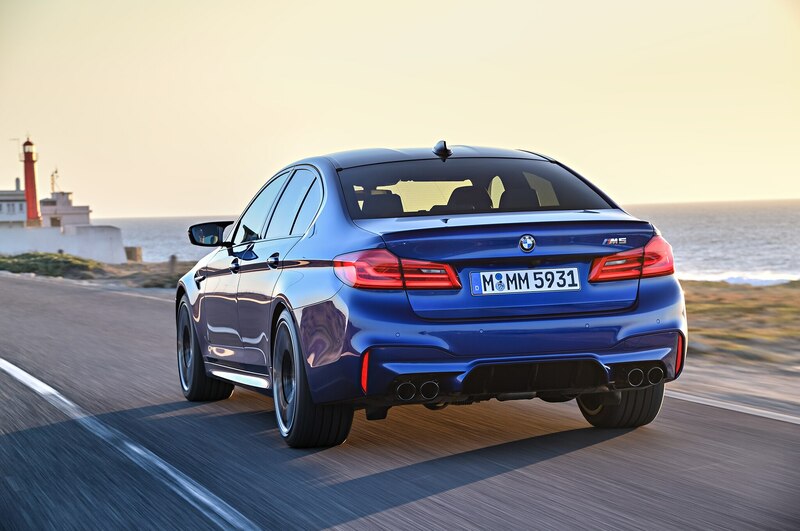 Top speed is 155 mph, or 189 mph if you pay for the optional M Driver’s Package. 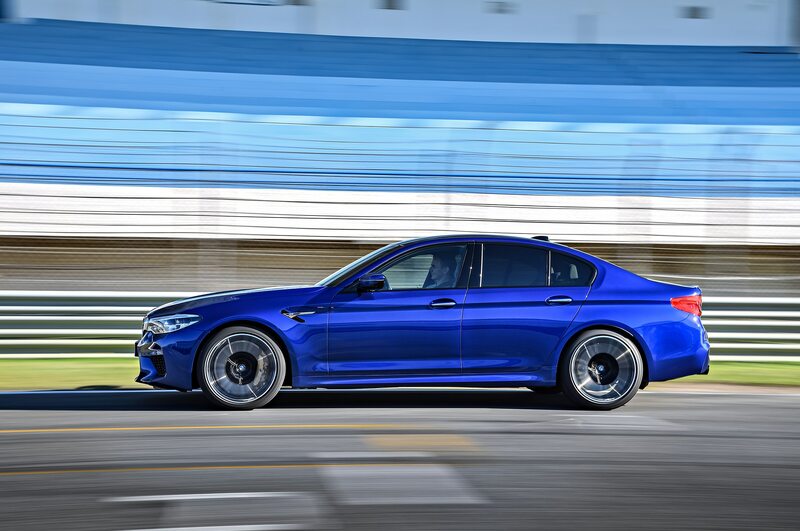 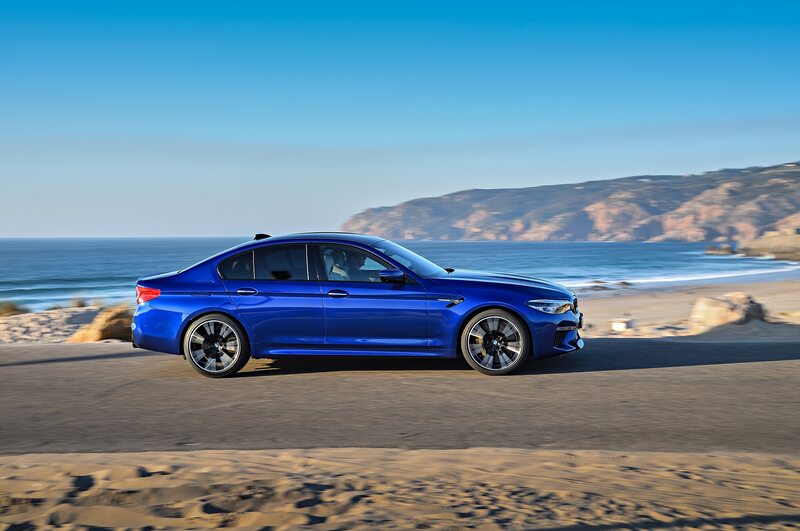 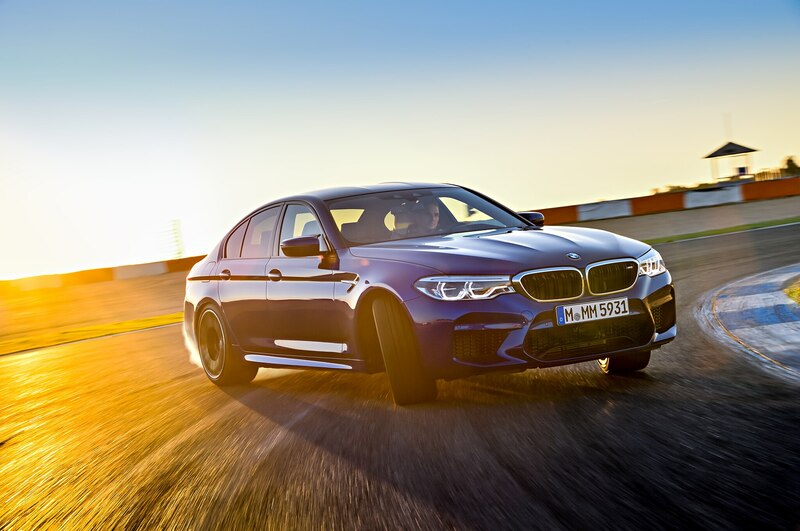 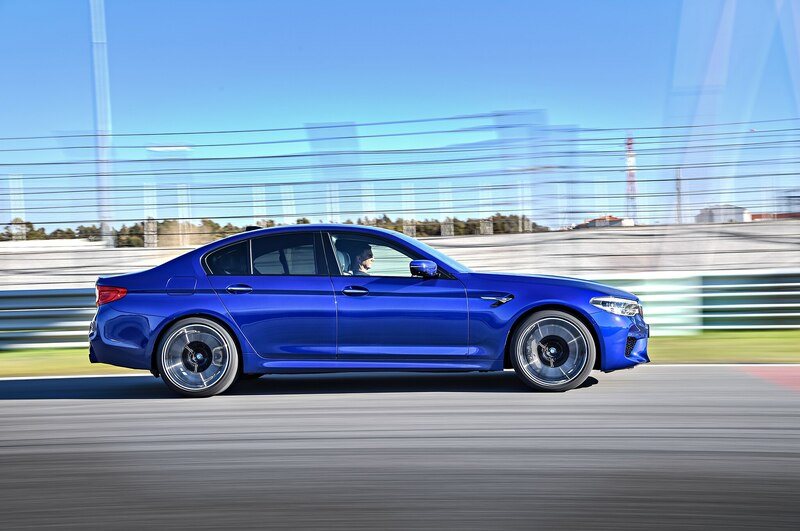 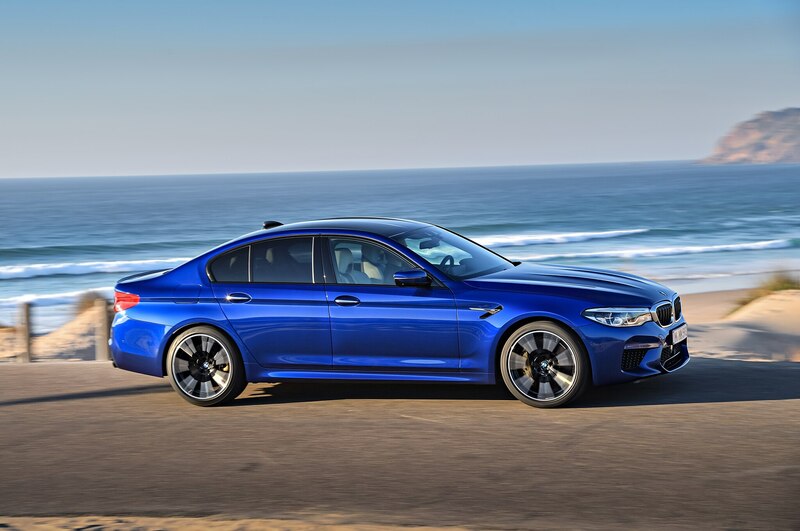 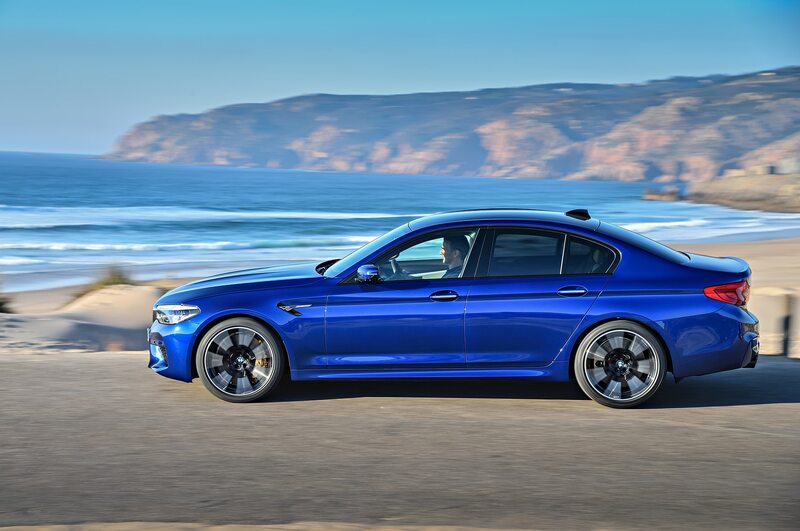 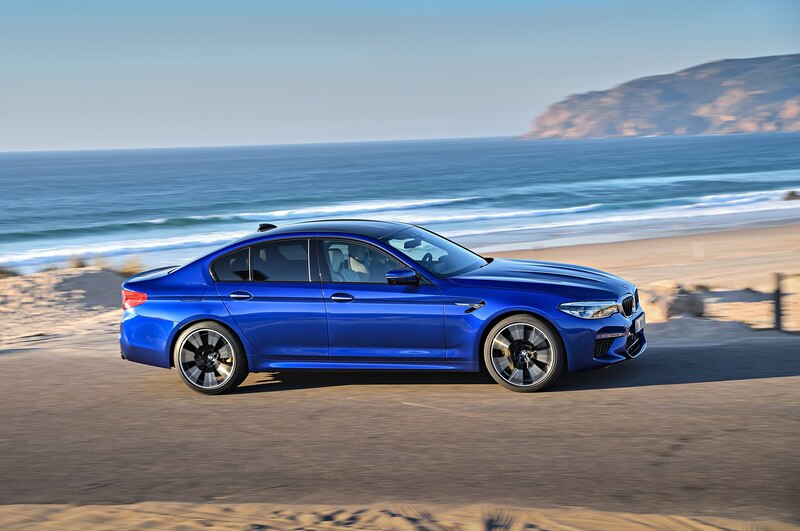 The F90 M5 serves as the debut vehicle for BMW’s M-specific all-wheel-drive system, M xDrive. 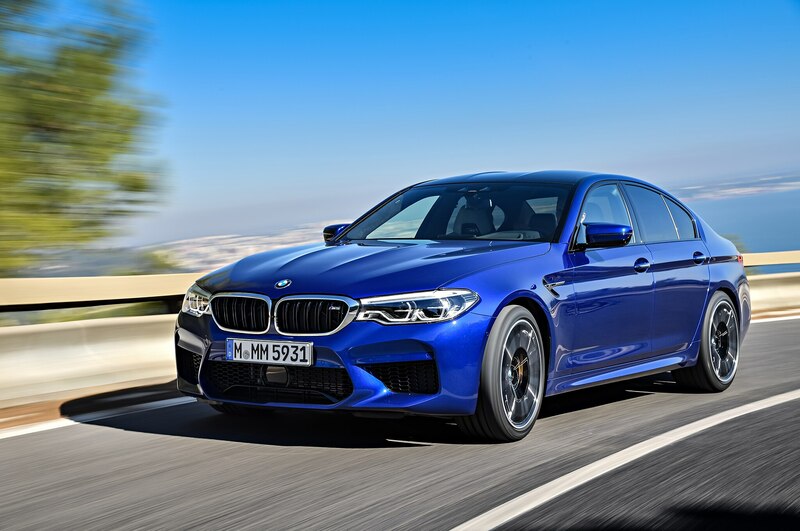 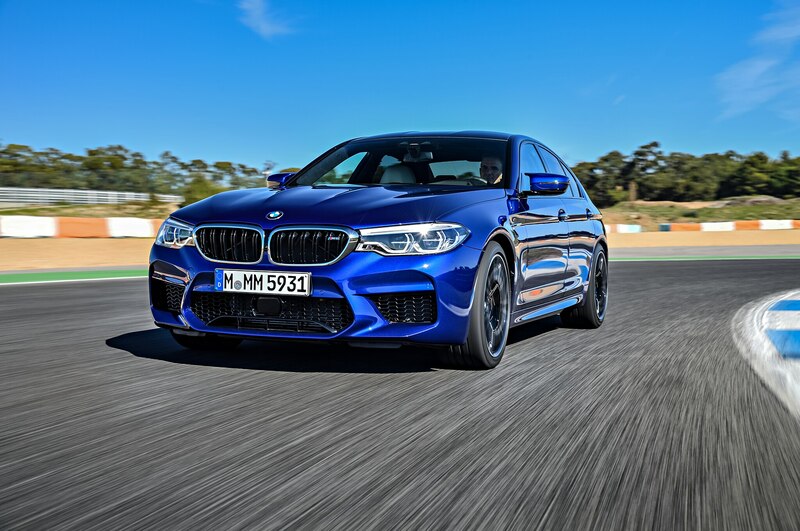 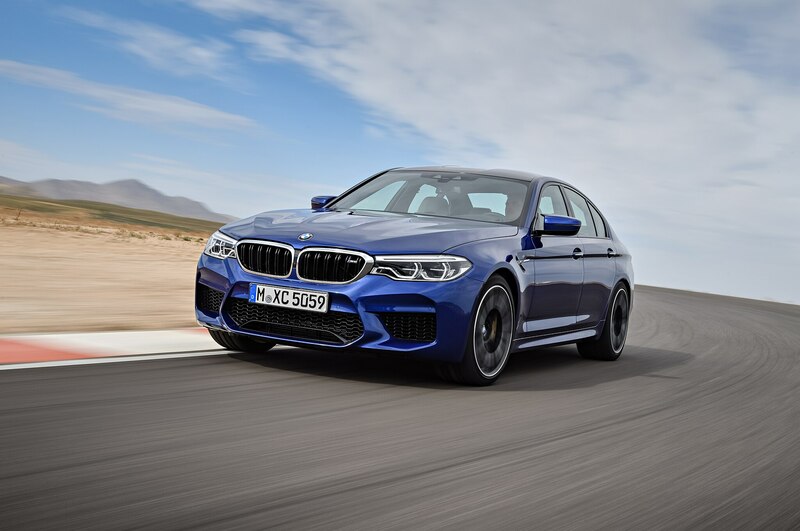 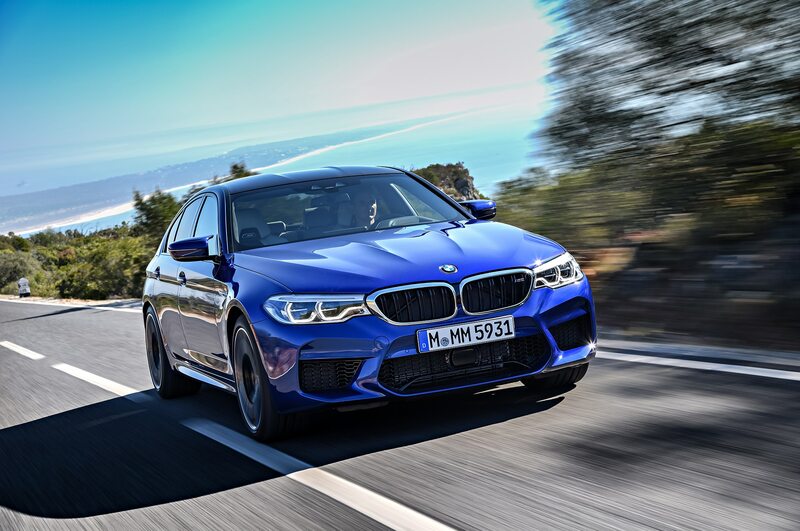 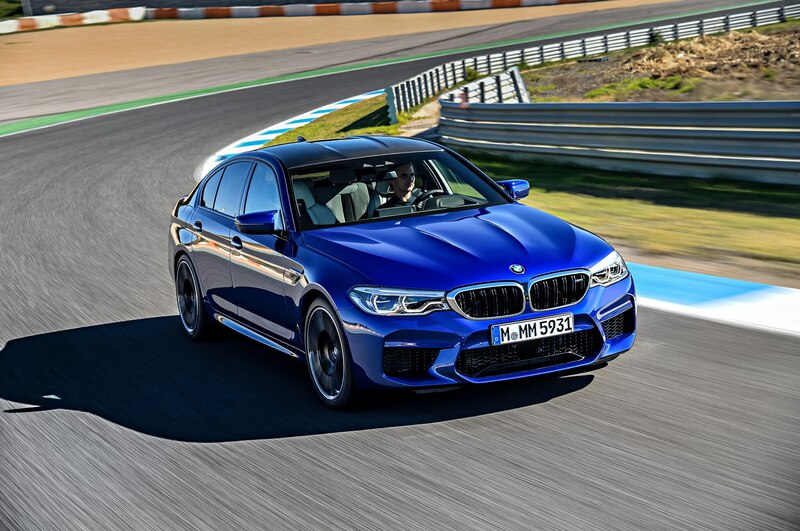 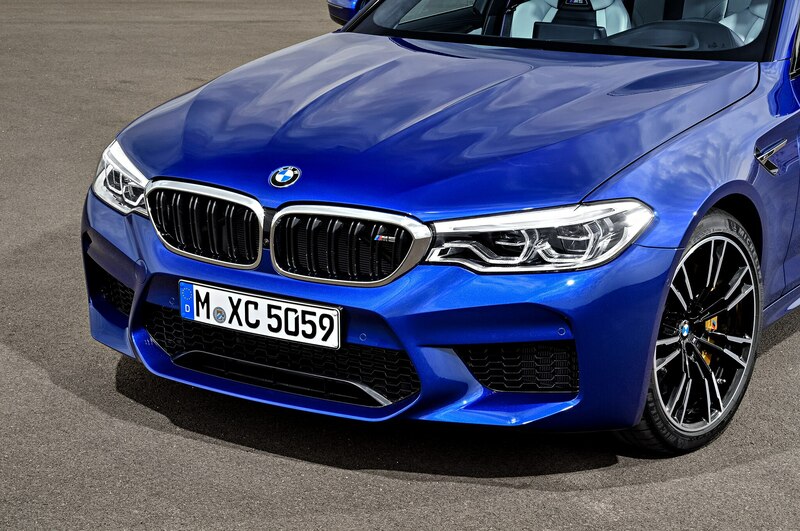 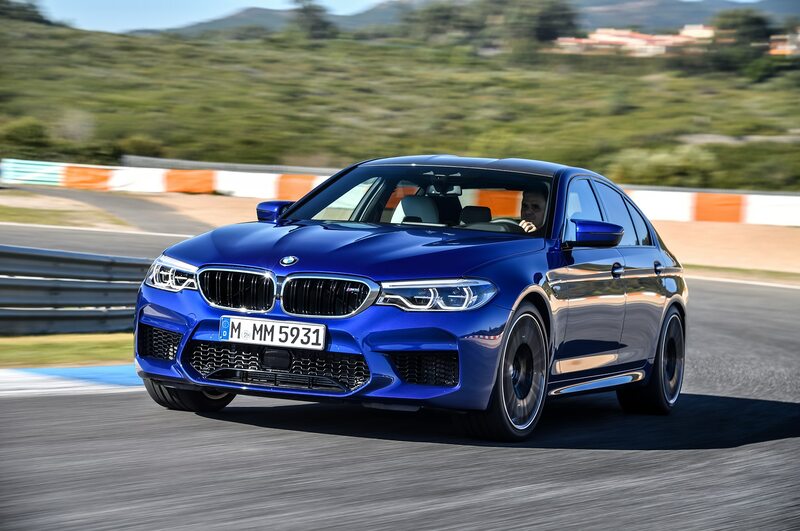 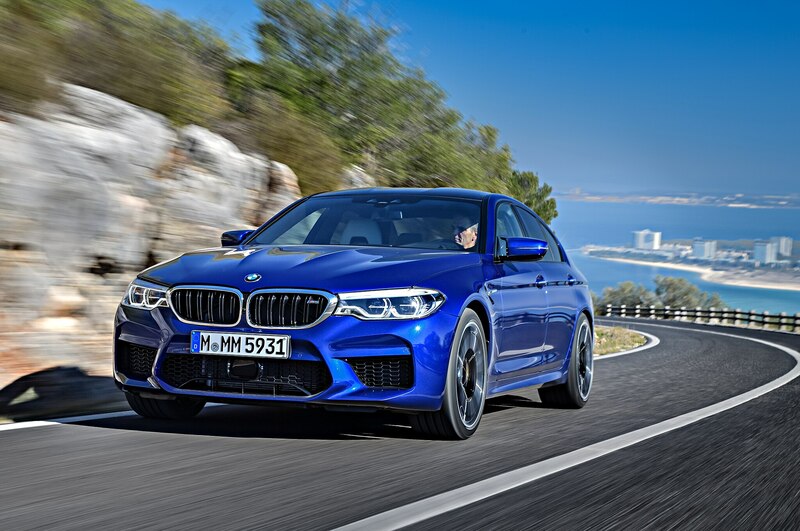 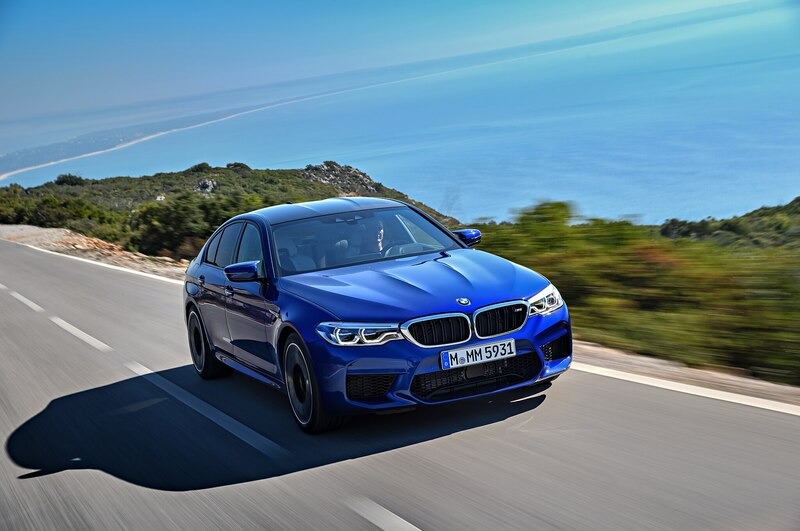 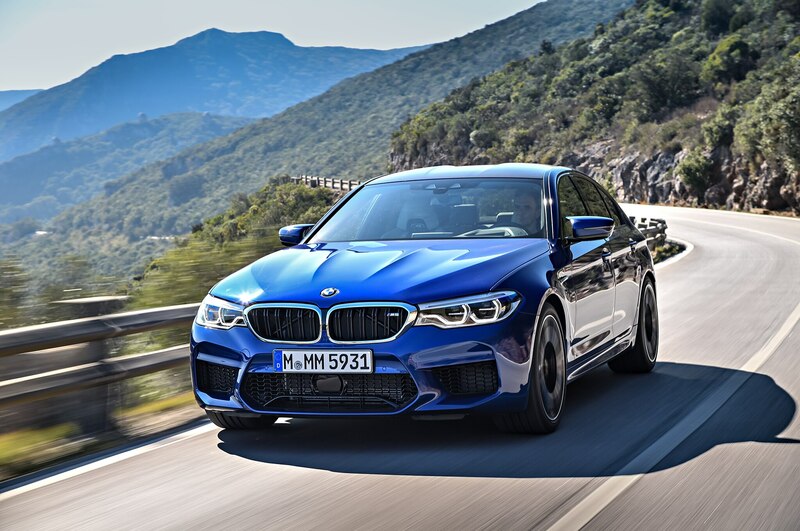 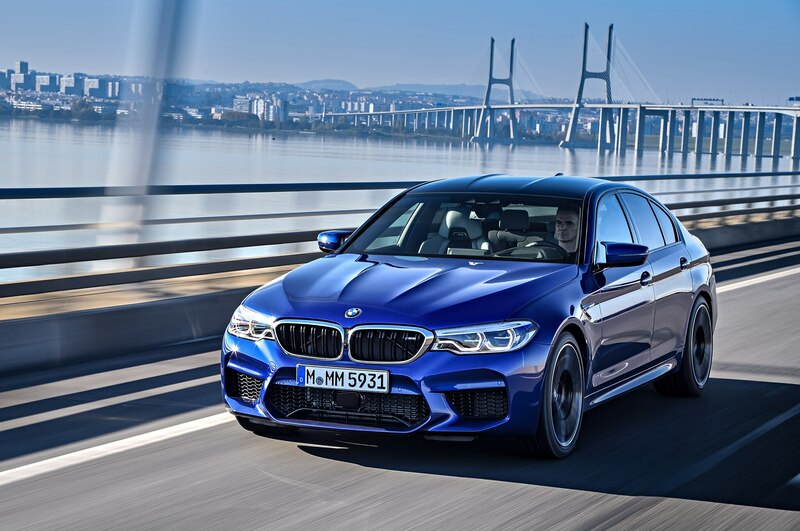 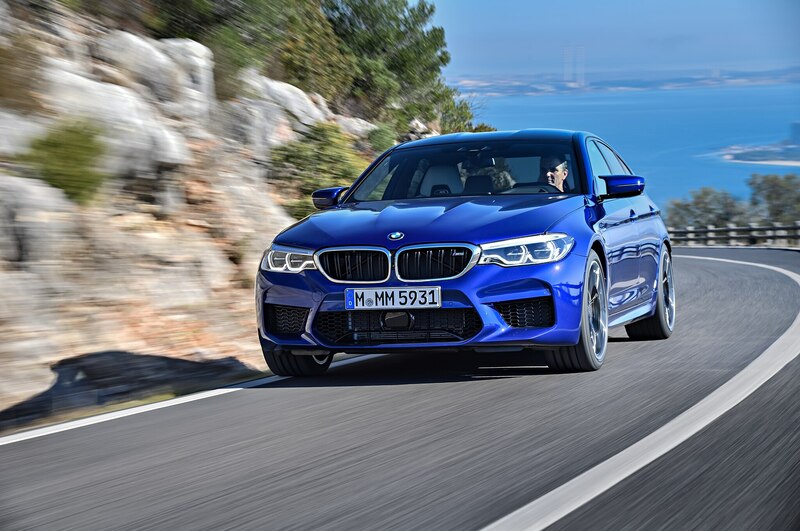 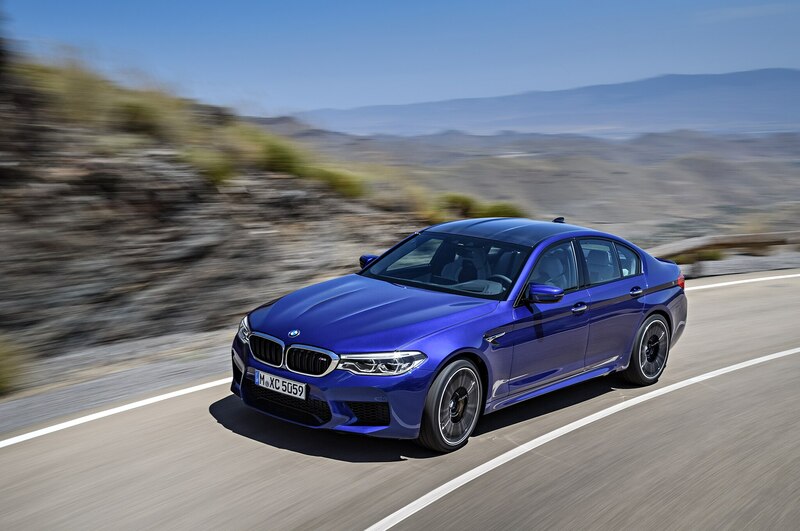 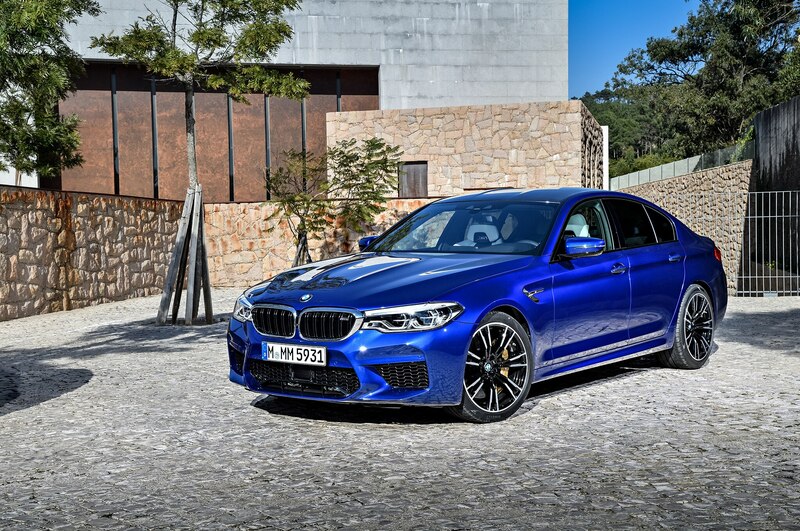 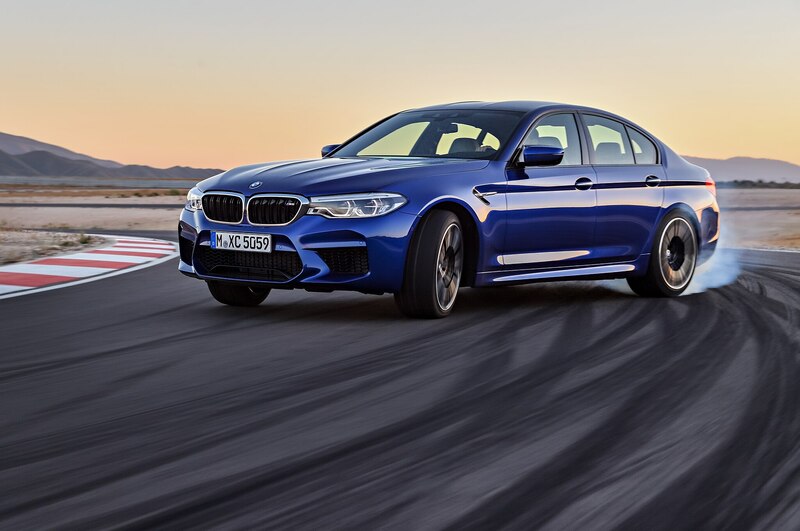 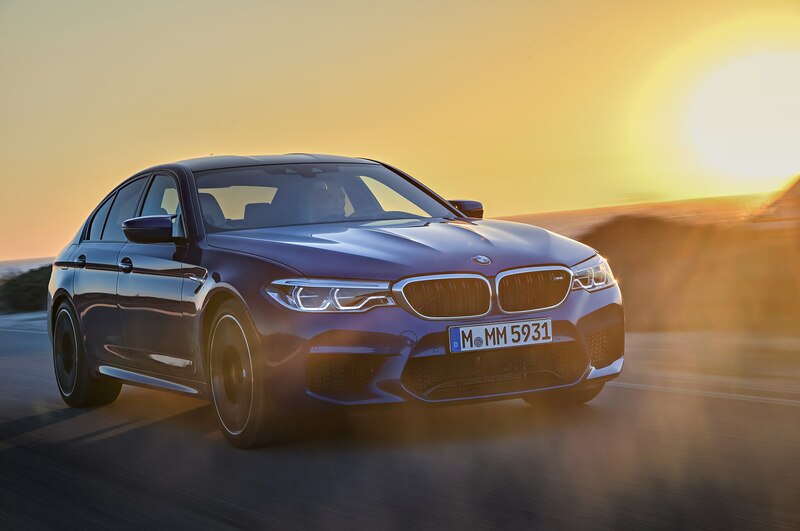 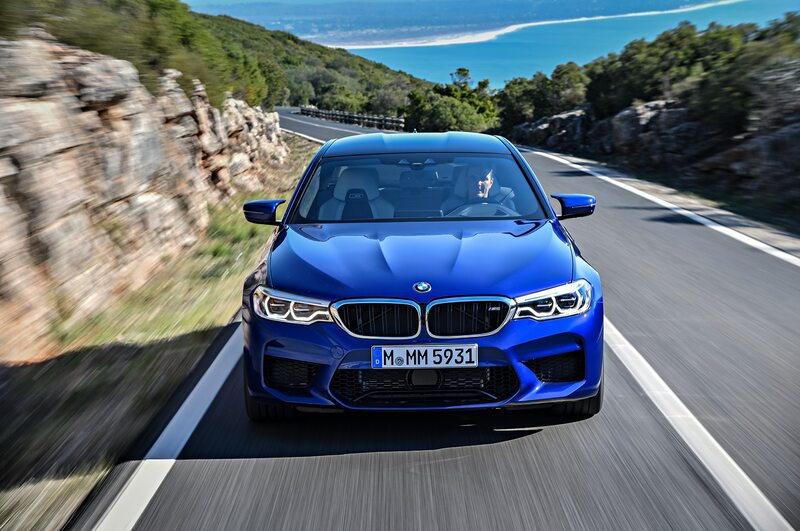 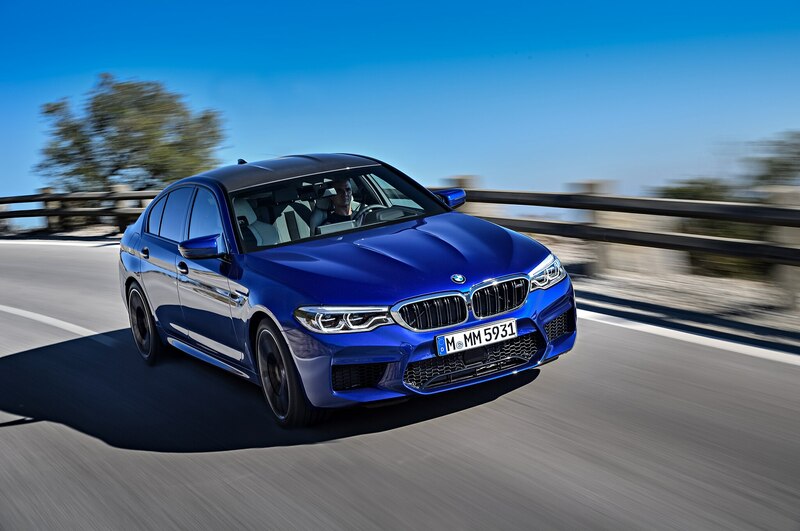 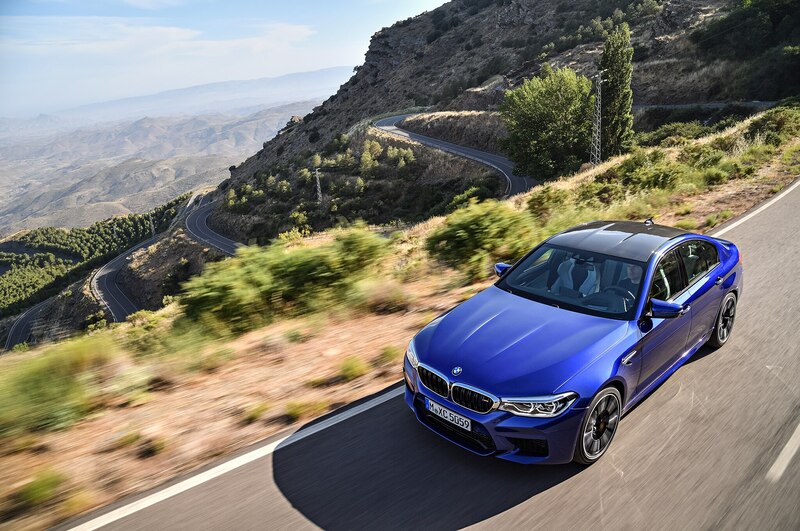 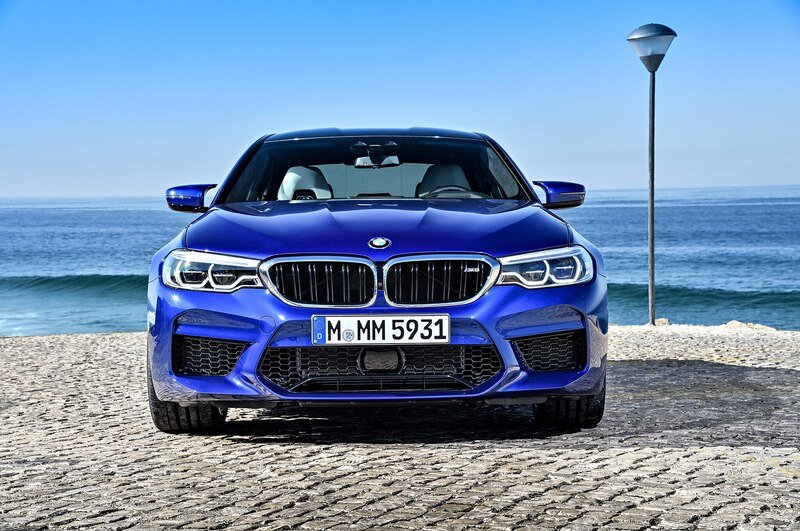 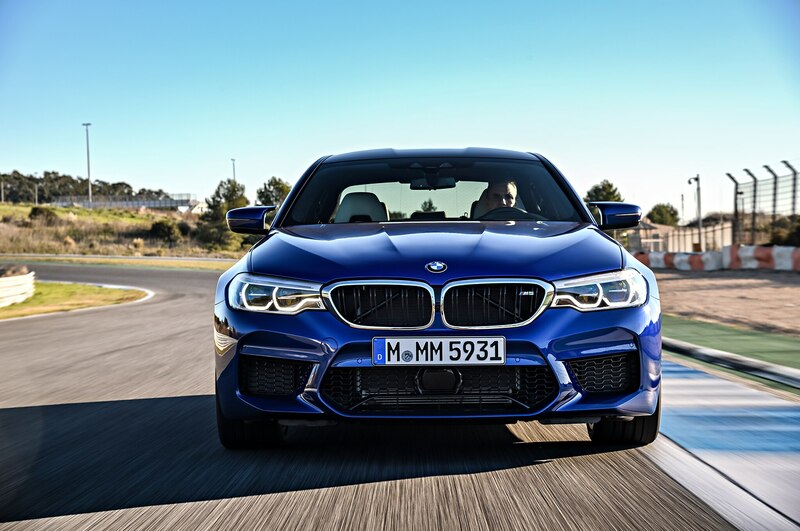 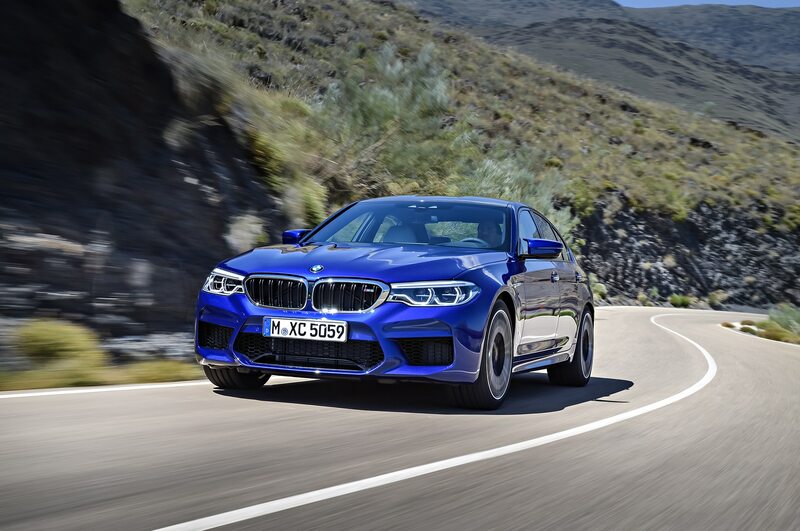 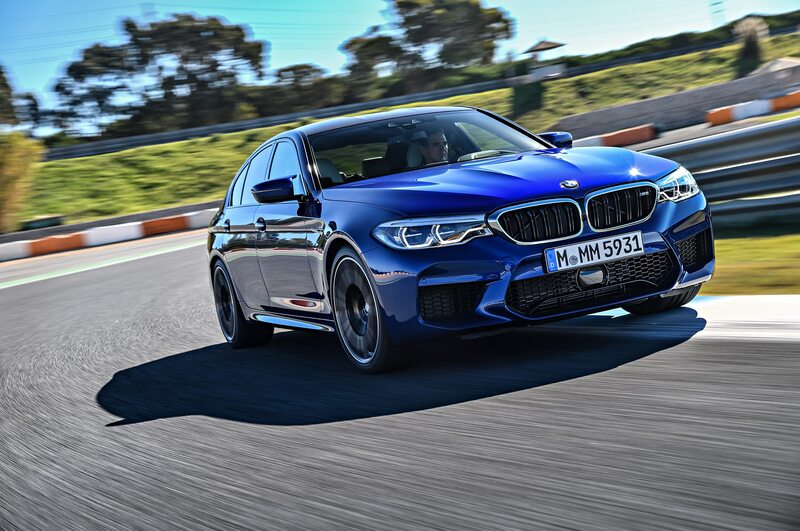 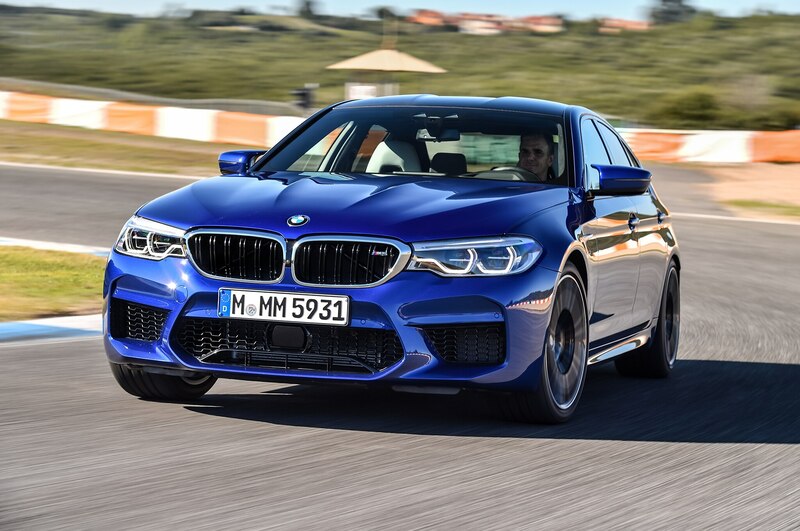 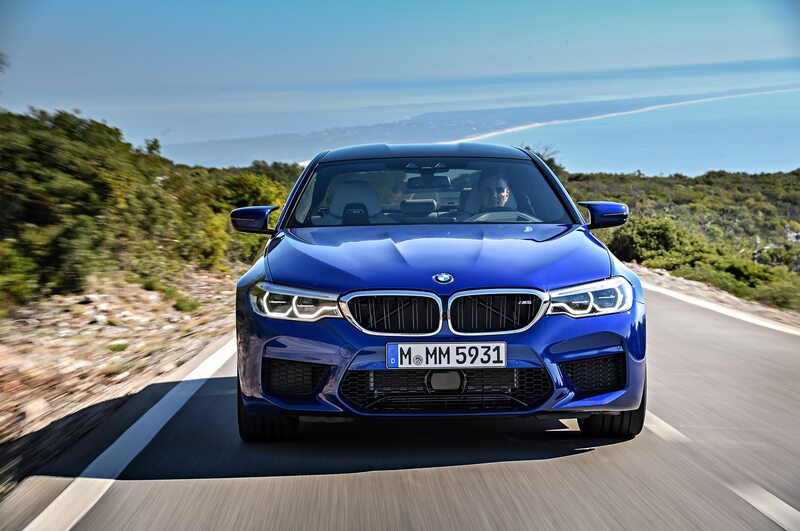 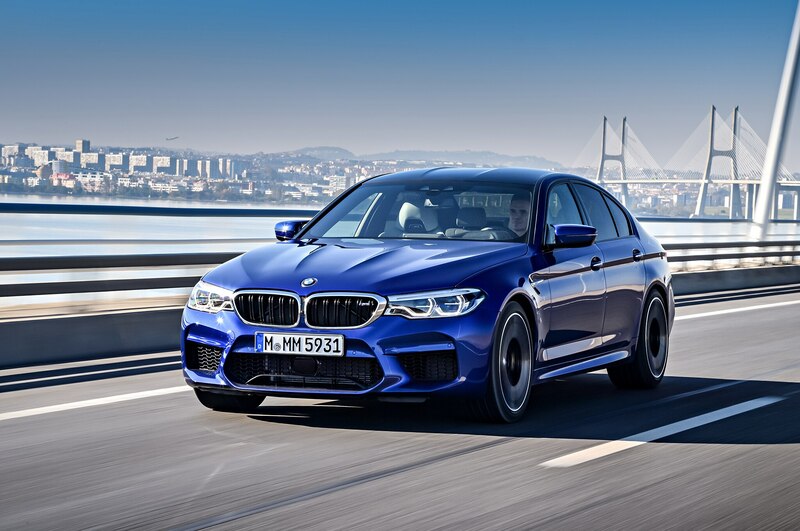 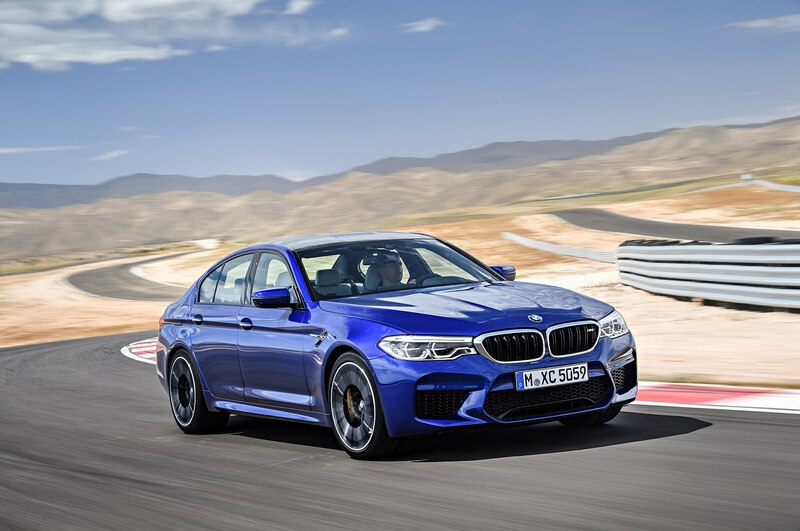 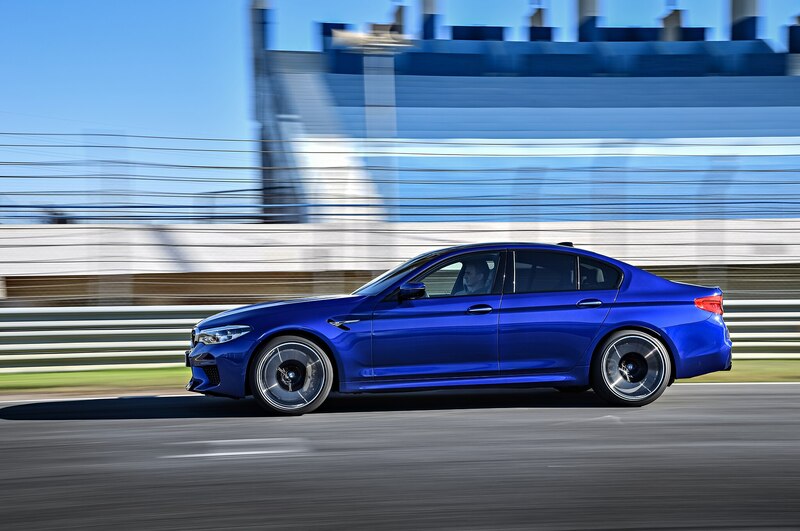 It allows the M5 to be switched between AWD and RWD modes, while the Active M Differential distributes the drive flow between the rear wheels, varying the locking effect as the situation demands. 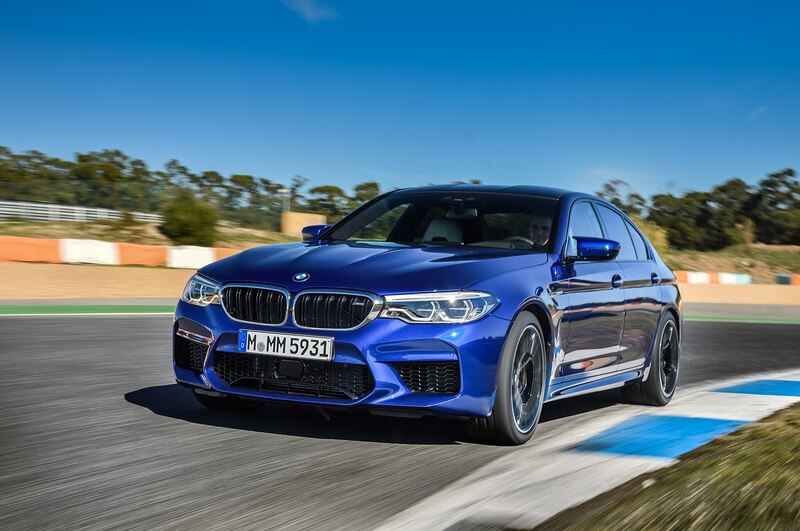 “Thanks to M xDrive, the all-new BMW M5 can be piloted with the familiar blend of sportiness and unerring accuracy both on the racetrack and out on the open road, while also delighting drivers with its significantly enhanced directional stability and controllability right up to the limits of performance when driving in adverse conditions such as on wet roads or snow,” said Frank van Meel, BMW chairman, in a lengthy sentence. 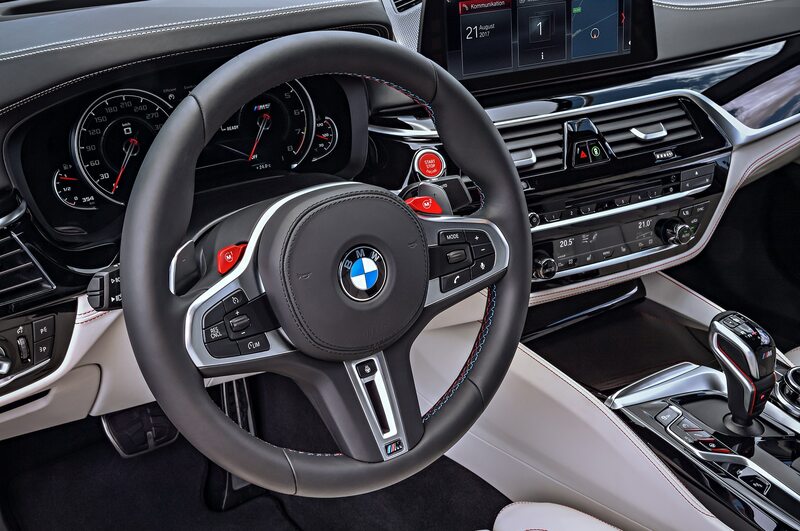 The engine can be set to Efficient, Sport, or Sport Plus modes, and the sound from the exhaust system can be controlled to “further acoustic customization” with the push of a button. 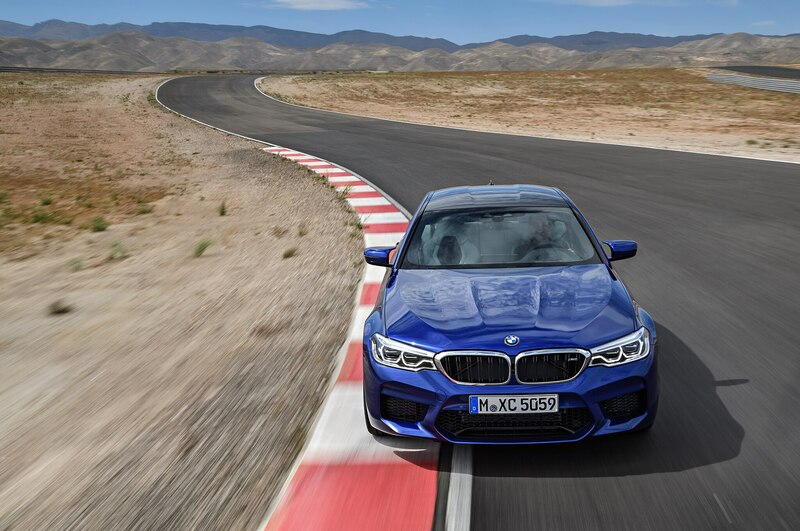 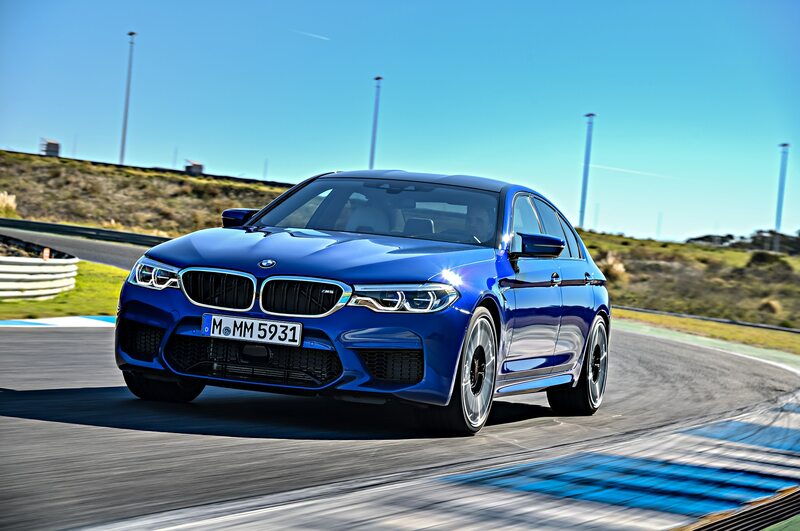 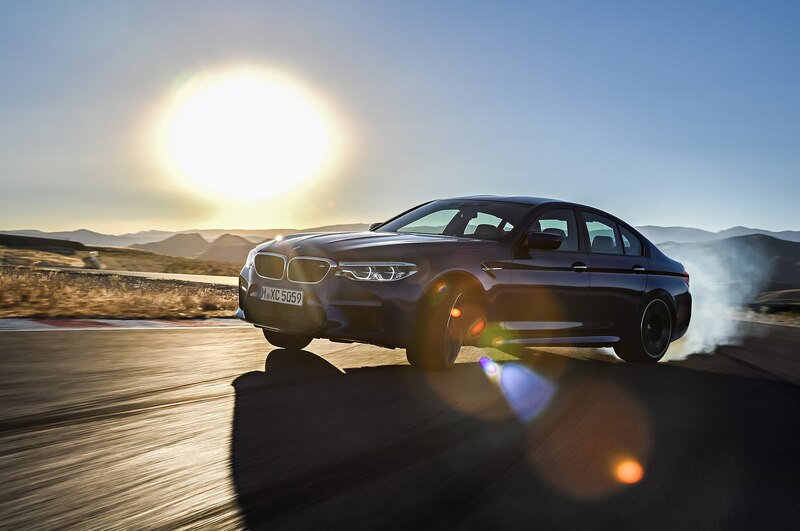 BMW says switching to the M Dynamic mode gives additional boost to the sedan’s handling agility. 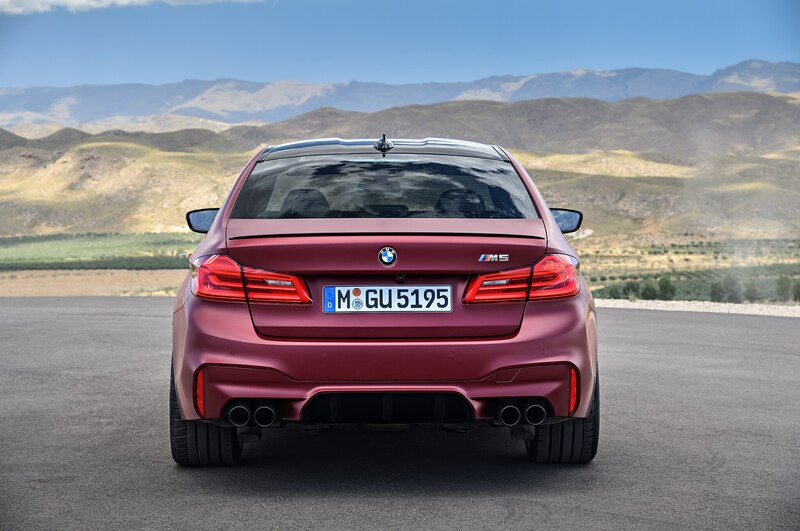 “In this mode, more drive torque is directed to the rear axle, while the amount of permissible rear wheel slip is increased. 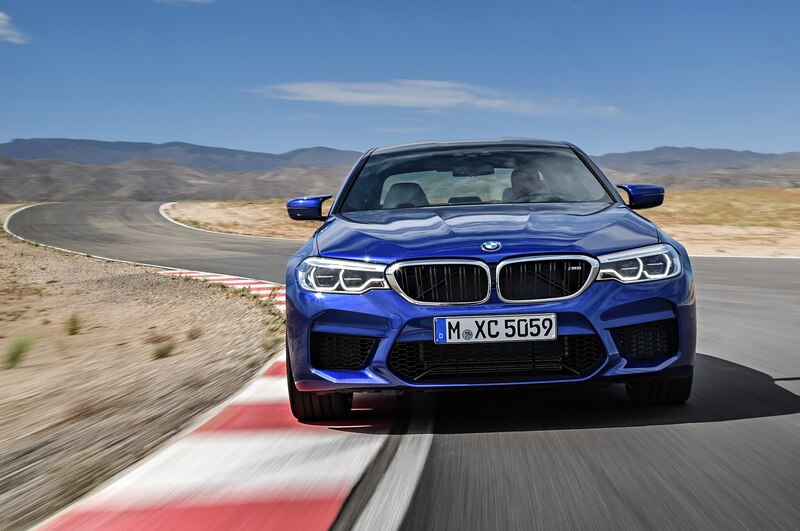 While doing so, the onset of oversteer is noticeable in good time and the linear increase of the sideslip angle means that the vehicle remains stable,” noted BMW’s release. 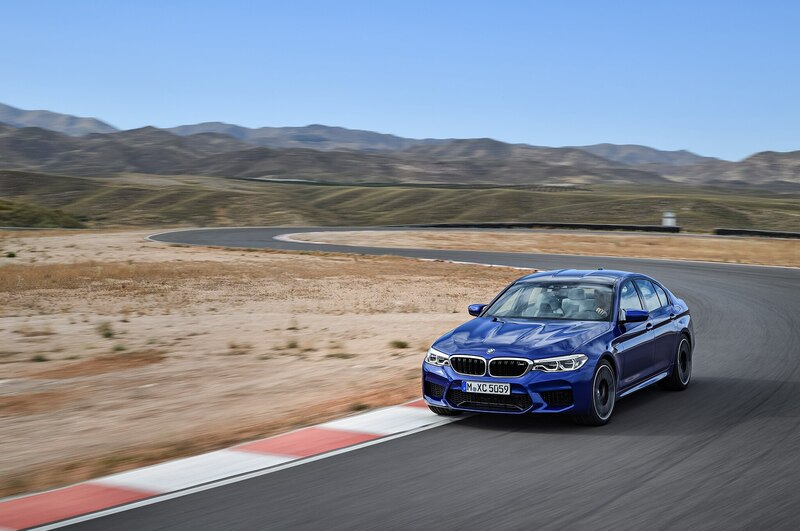 Up front, the double-wishbone suspension has been reworked and stability is improved thanks to the increased track width. 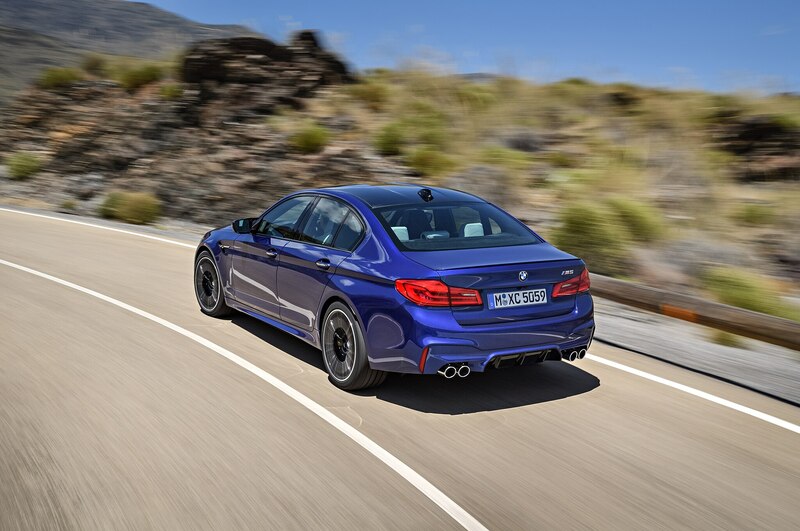 The five-link rear suspension has also been modified for better handling. 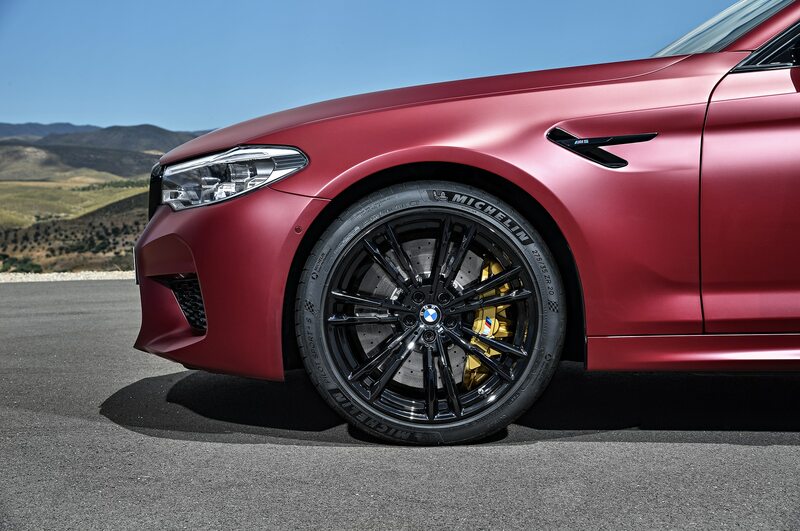 The M5 rolls on 275/40R19 rubber up front and 285/40R19 tires at rear. 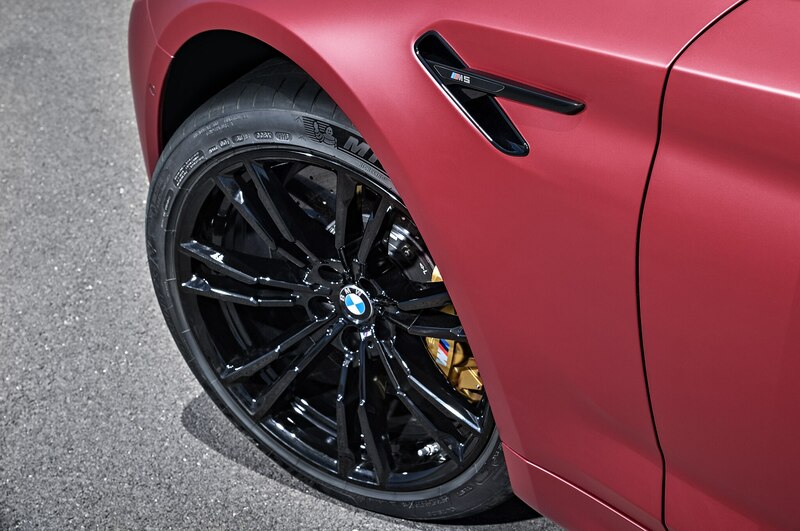 These are mounted on five-double-spoke cast wheels in Orbit Gray. 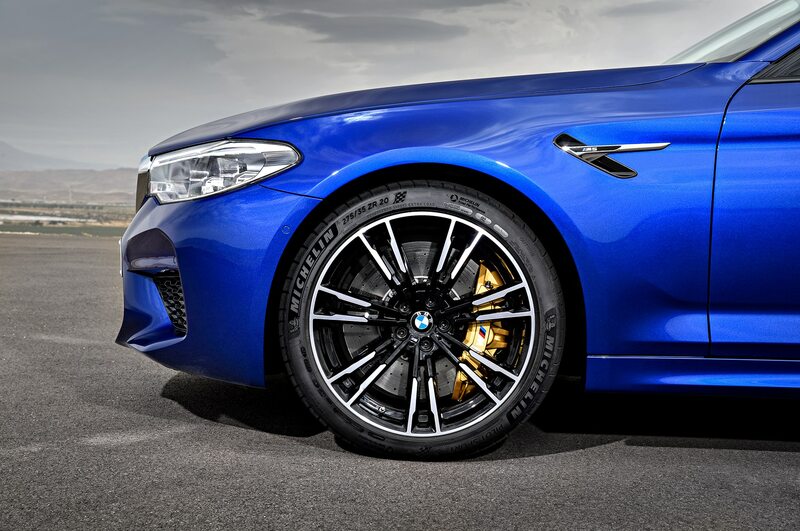 M compound brakes are also fitted as standard. 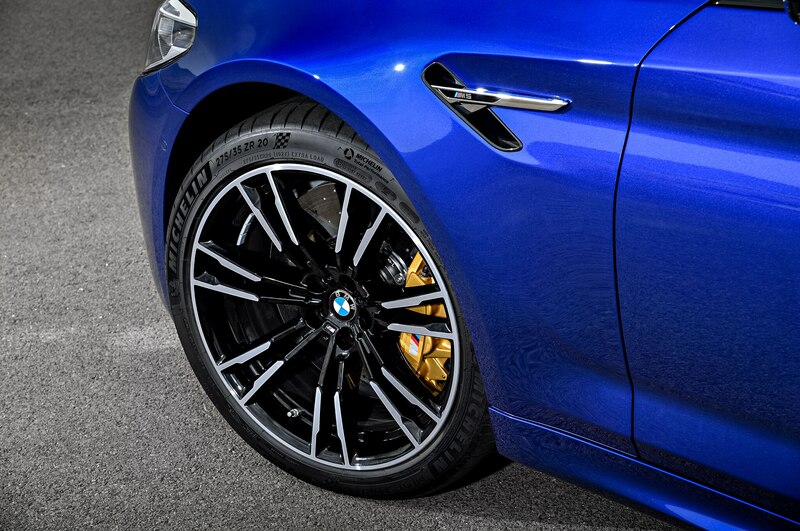 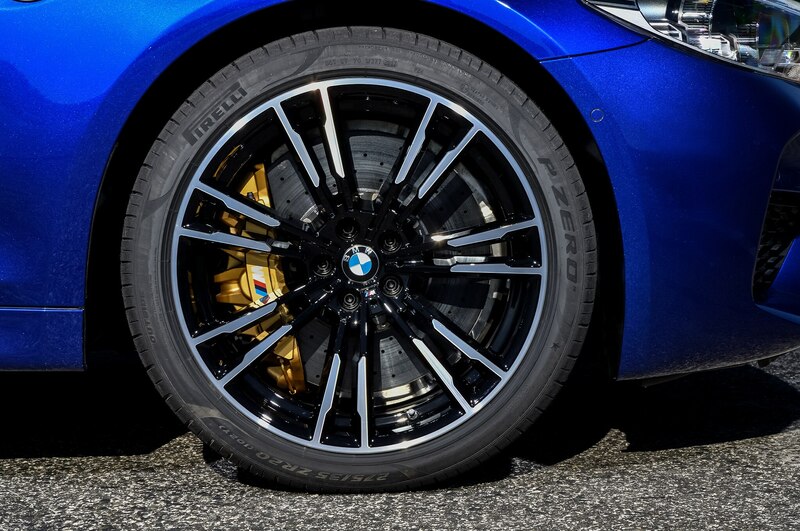 M carbon-ceramic brakes with gold-colored calipers are optional and help shed 50 pounds of weight. 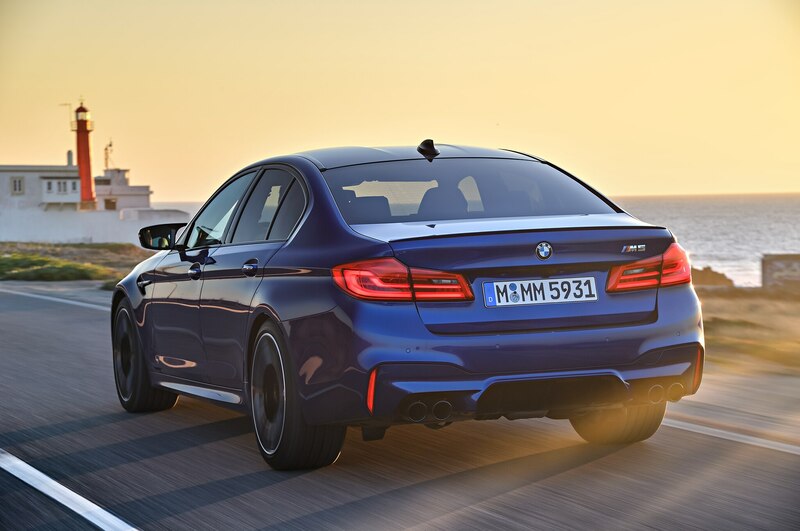 An aluminum hood and carbon fiber-reinforced plastic also help keep the weight down. 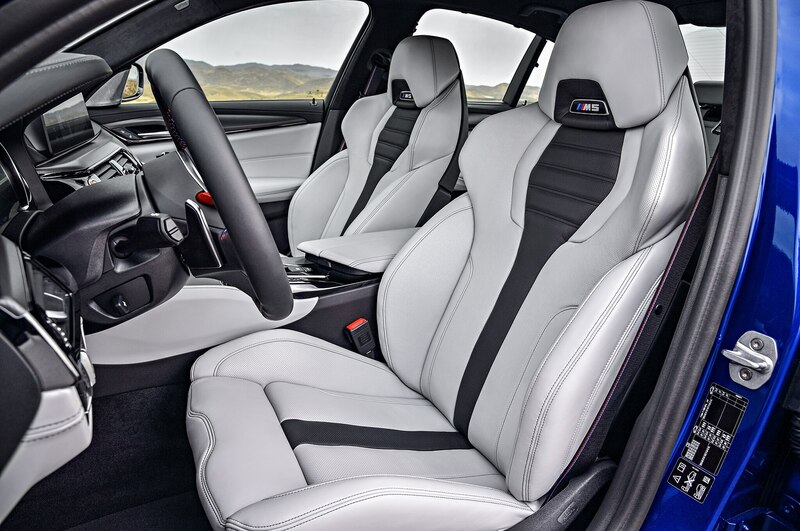 Inside, the four-door sedan seats four passengers. 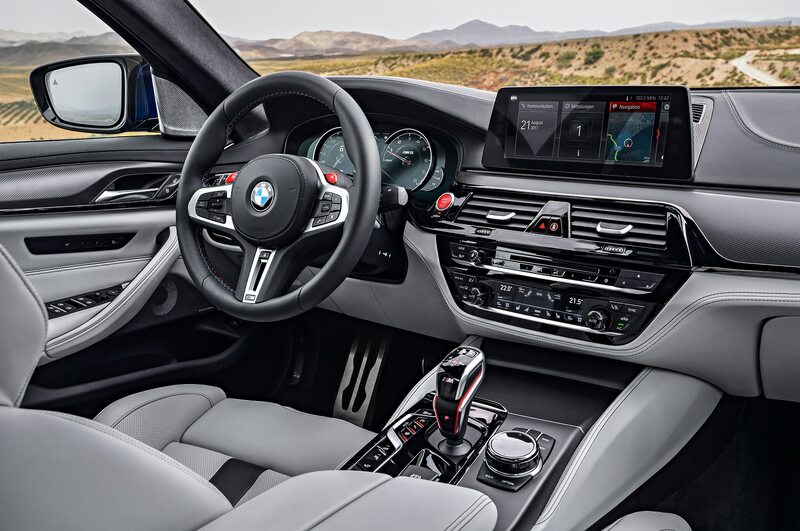 The touchscreen or Head-Up Display can be activated using BMW Gesture control. 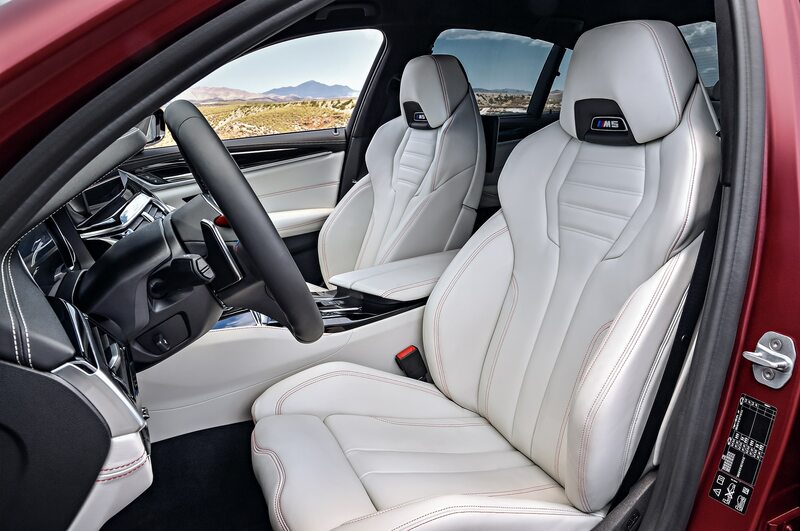 Bucket seats are trimmed in Merino leather with aluminum trim and other carbon-structure materials are used throughout the cabin. 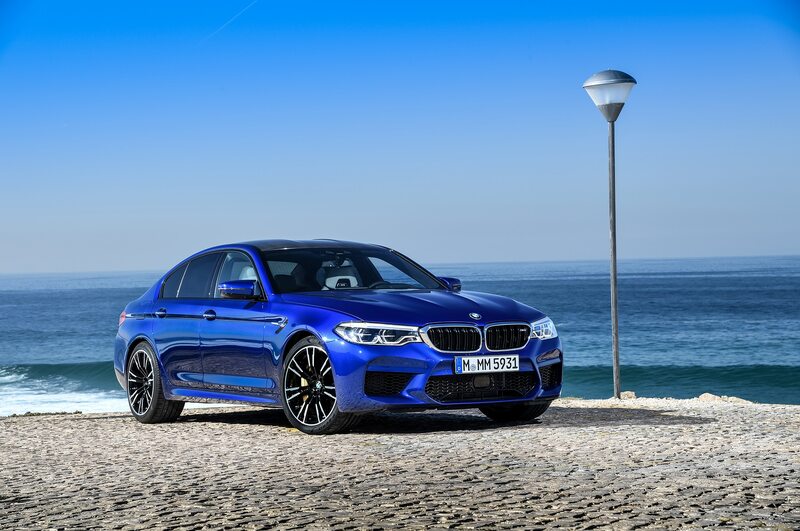 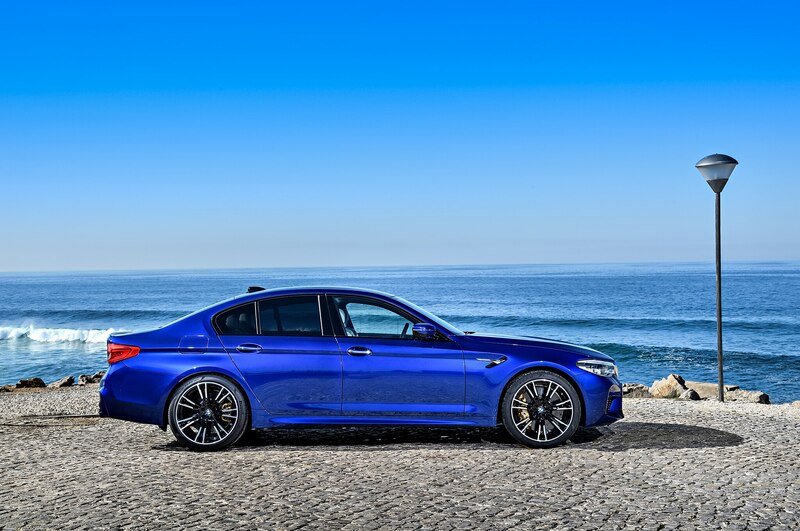 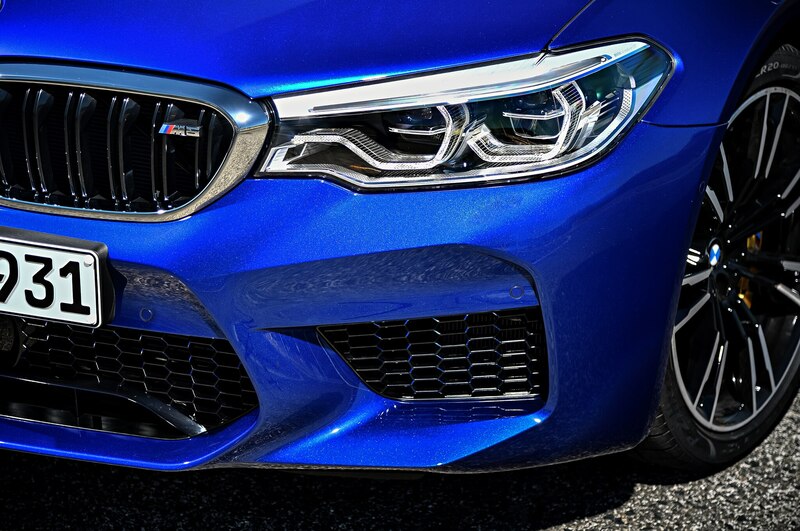 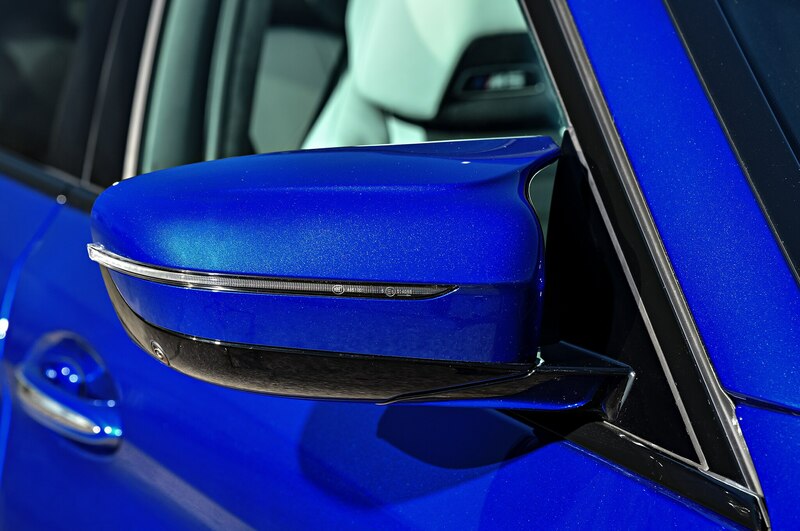 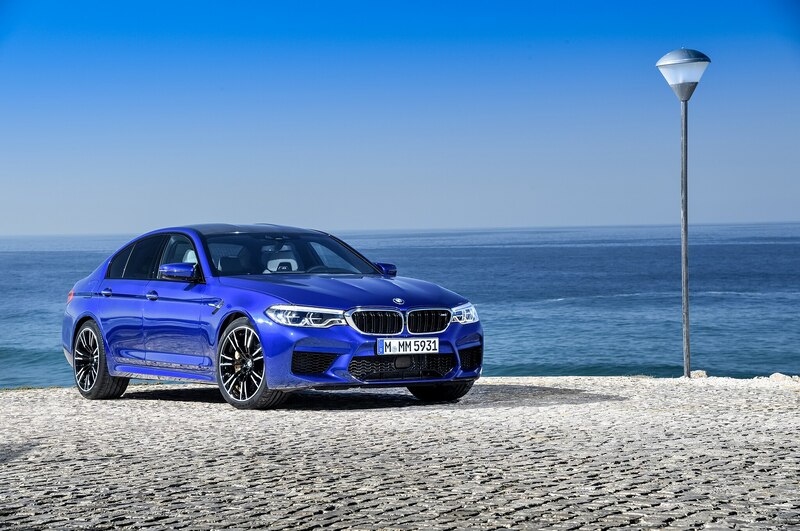 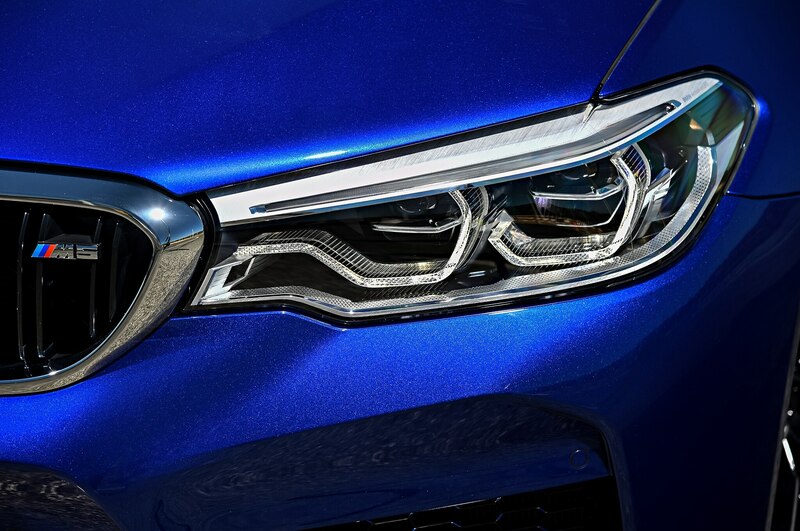 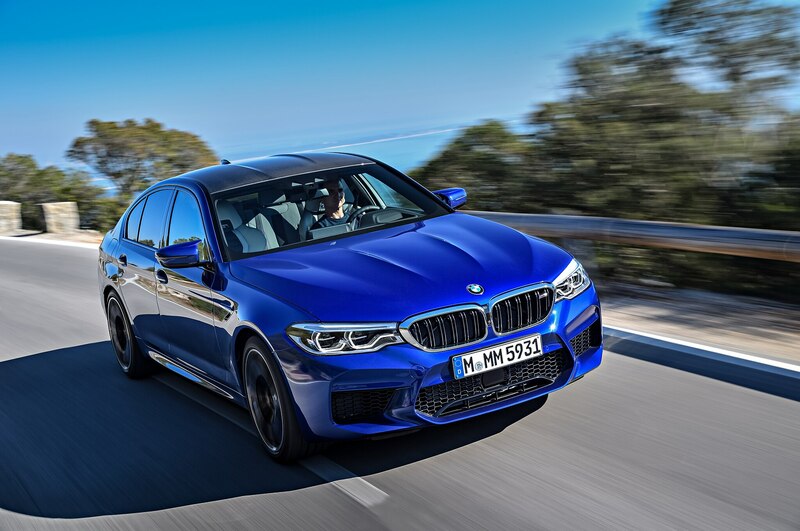 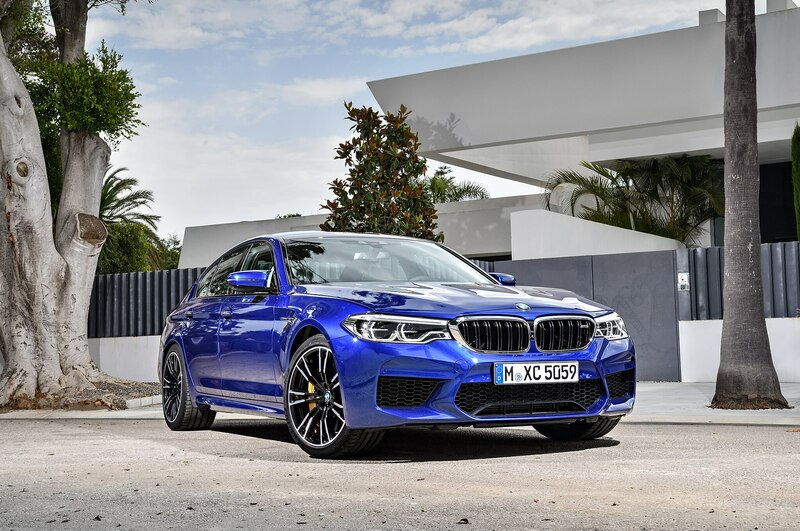 BMW now offers a new shade of blue in Marina Bay Blue Metallic for the M5. 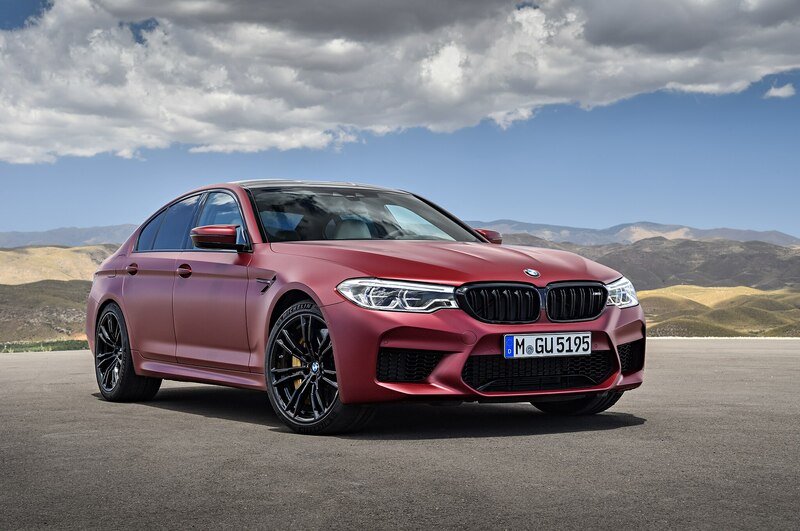 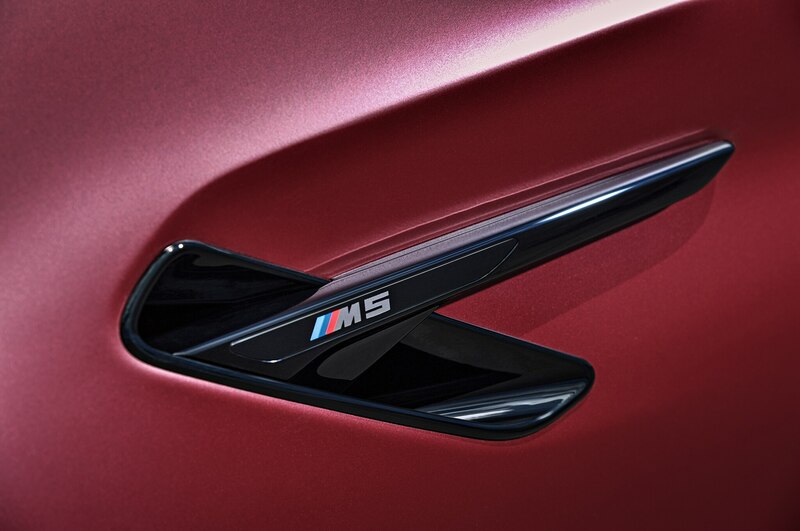 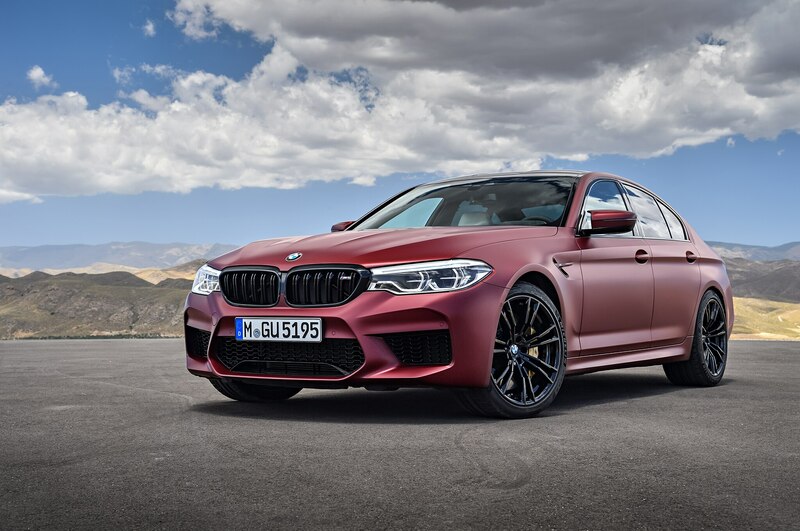 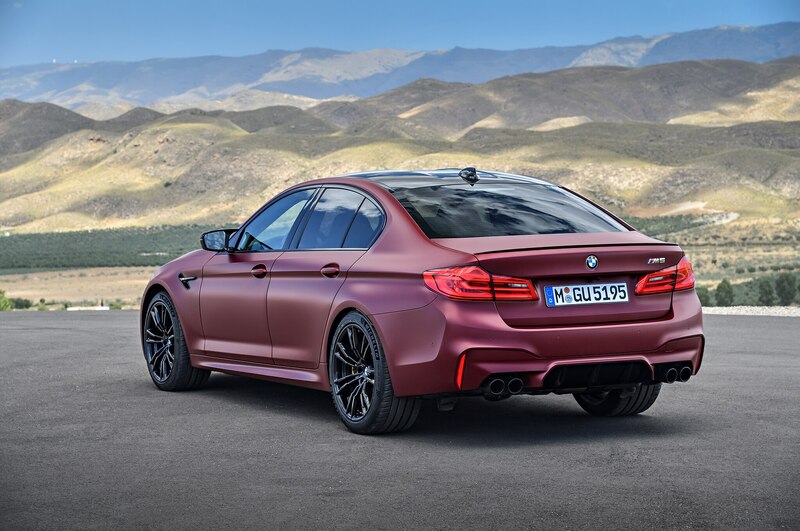 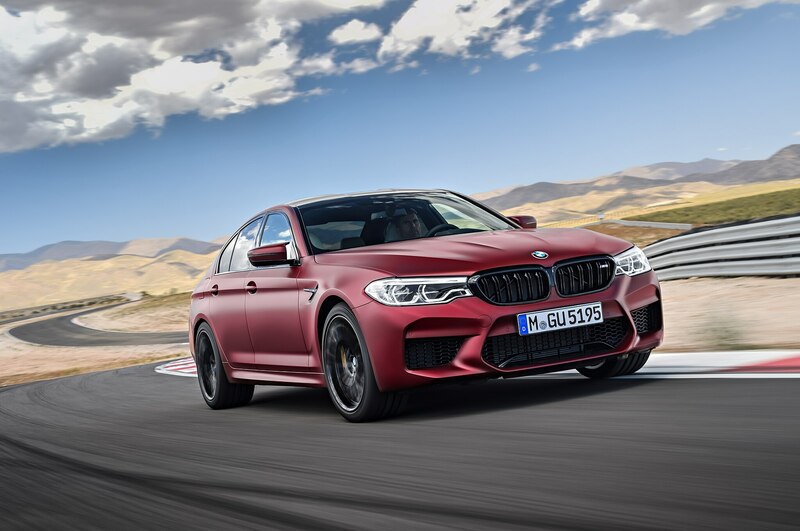 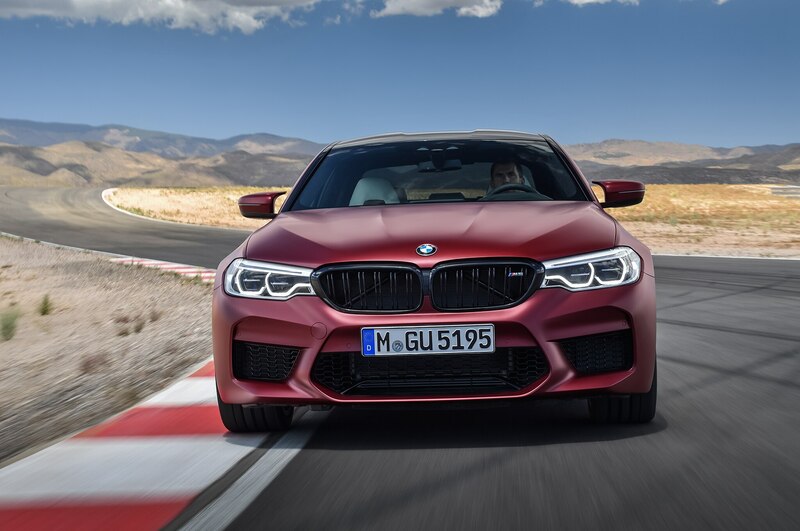 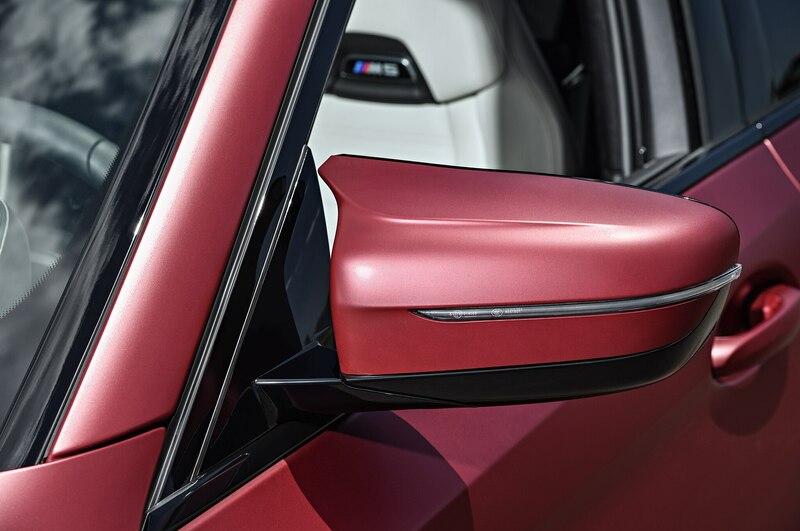 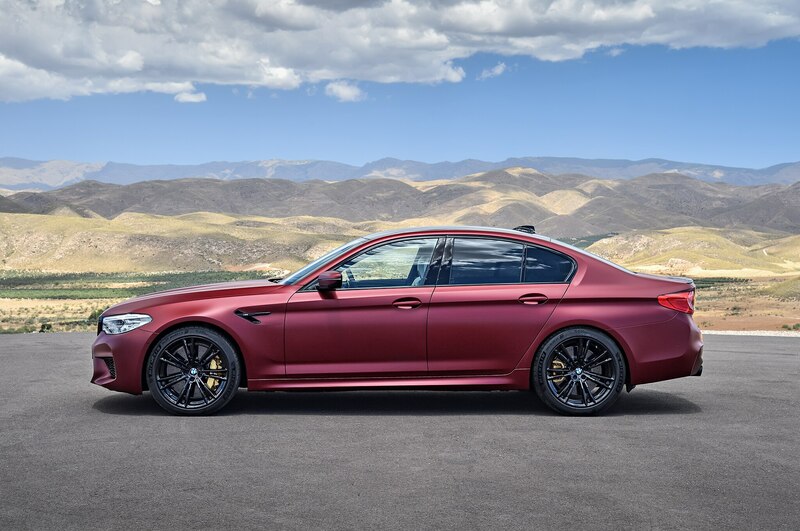 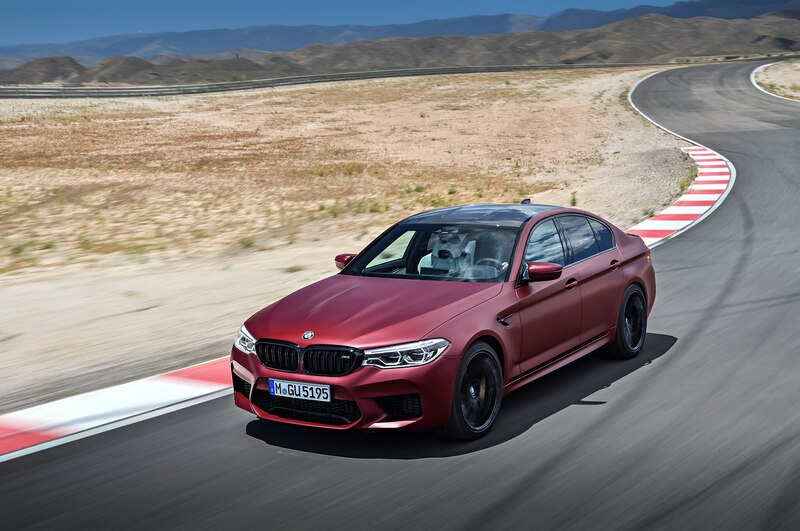 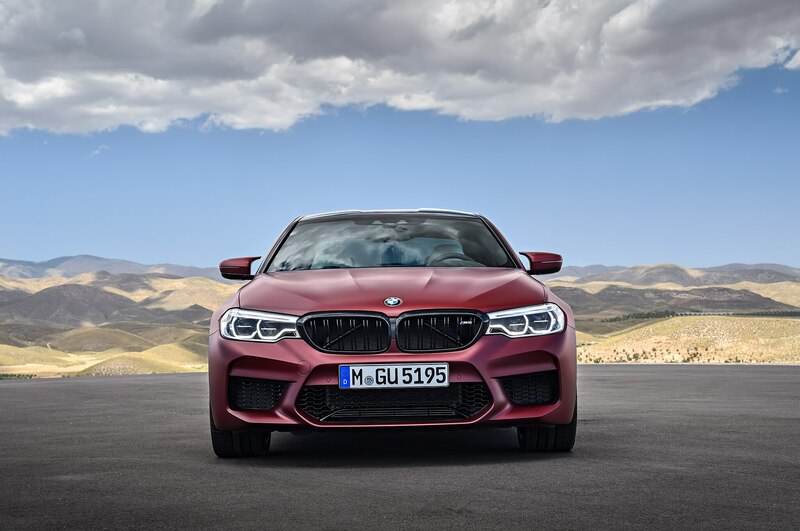 There’s a special BMW M5 First Edition available that is limited to 400 cars worldwide, with 50 of those slated for the U.S.
First Edition M5s get exclusive Frozen Dark Red Metallic paint and high-gloss Shadow Line trim. 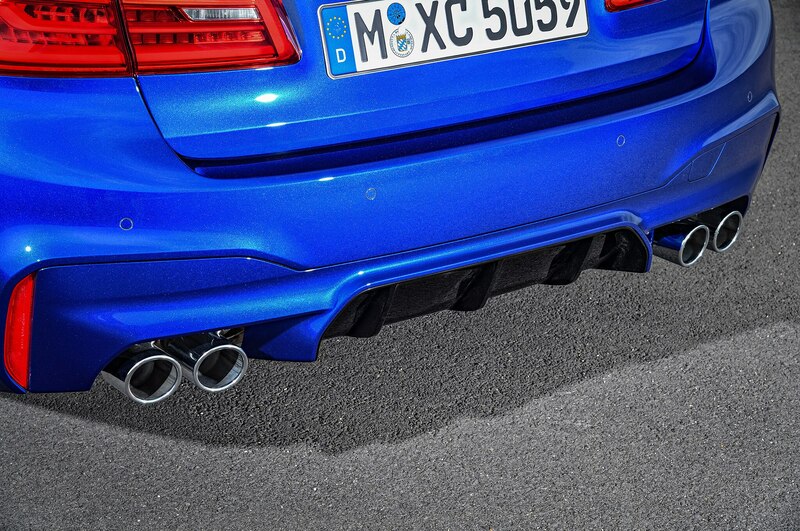 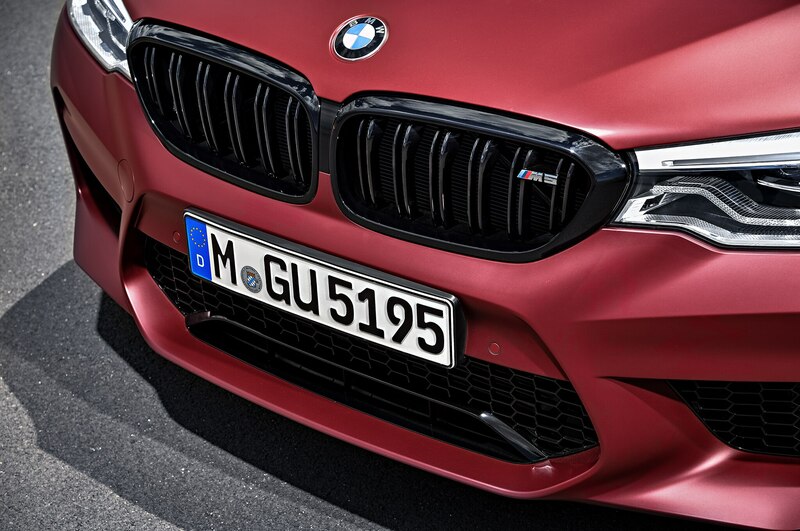 They also sport high-gloss black on the kidney grille, M gills, and the four tailpipes of the exhaust. 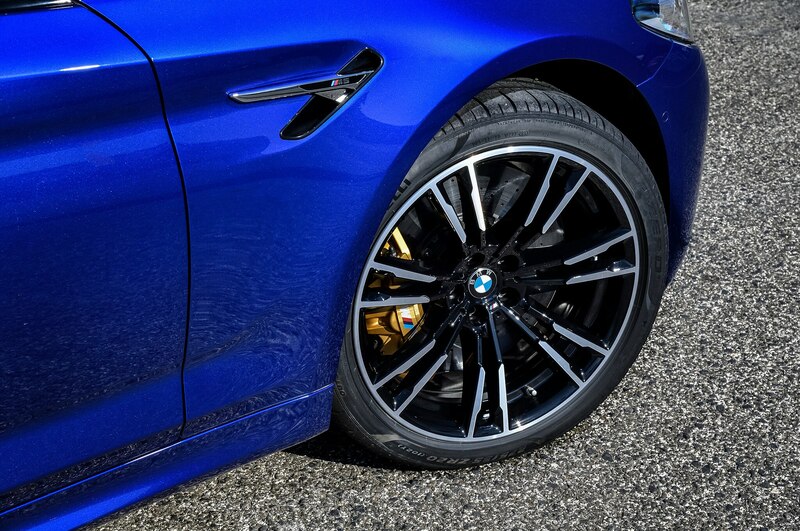 First Editions roll on 20-inch seven-double-spoke black wheels. 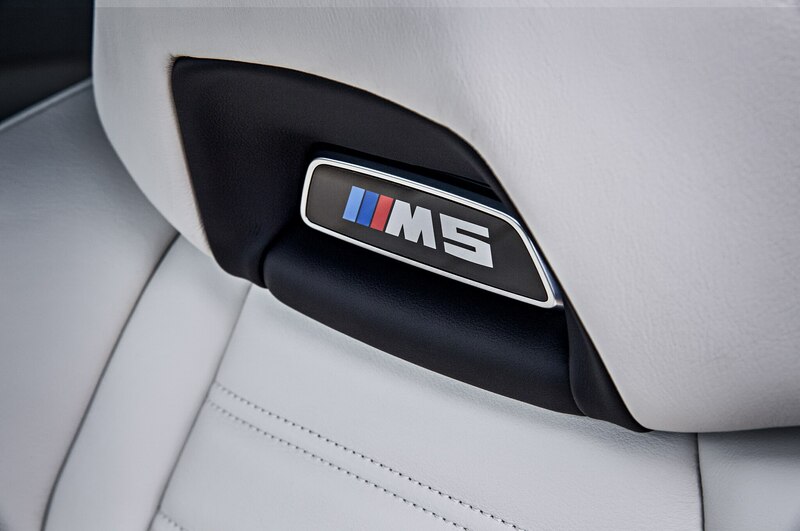 Inside, it gets Piano Finish Black flourishes, a production number plaque, M multifunction seats upholstered in Smoke White leather with red contrast stitching. 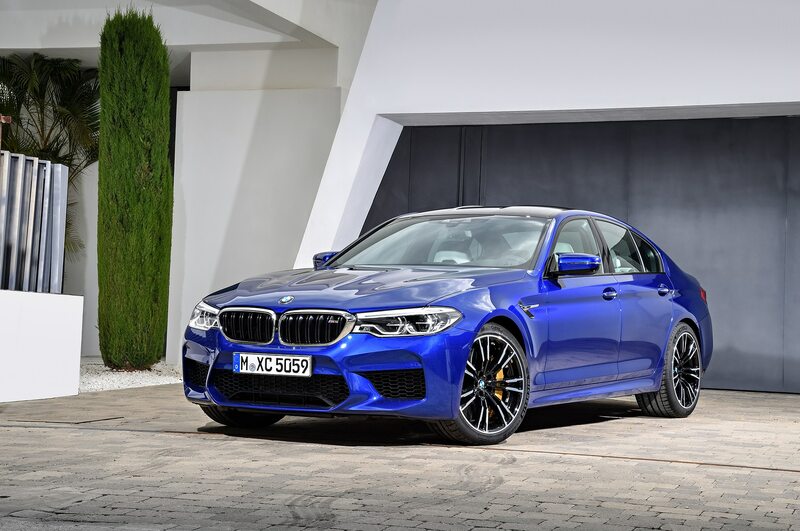 The 2018 BMW M5 will go on sale this coming spring. 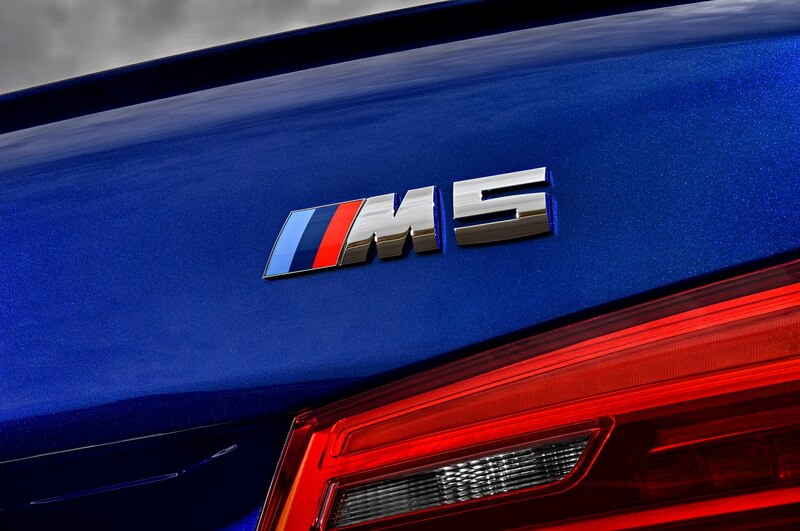 Pricing will be announced closer to the launch date.